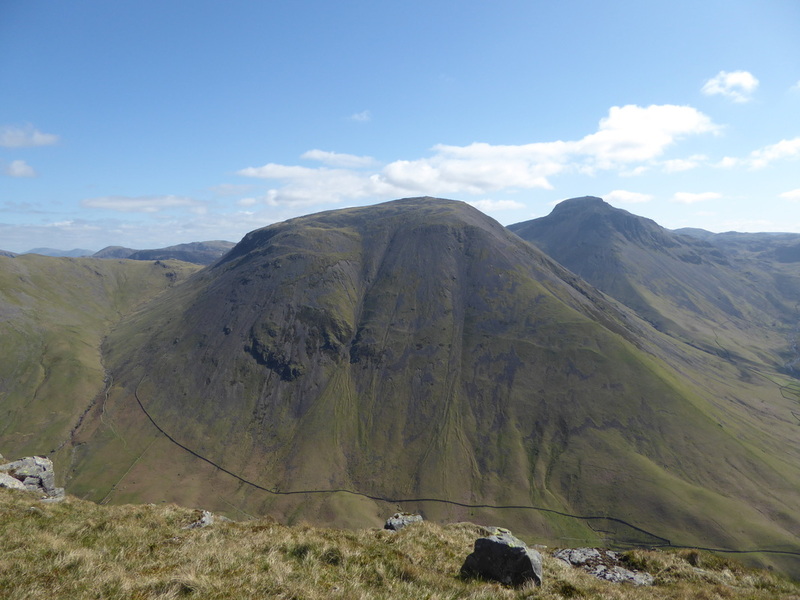 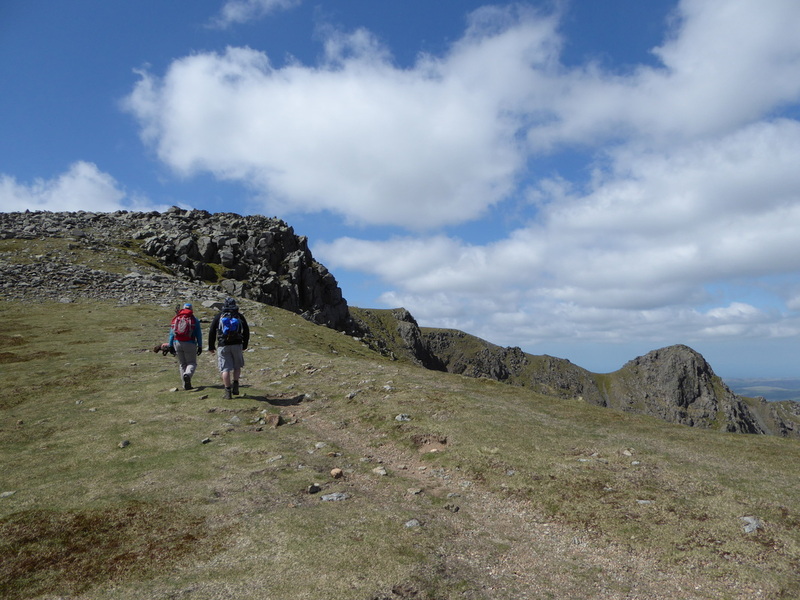 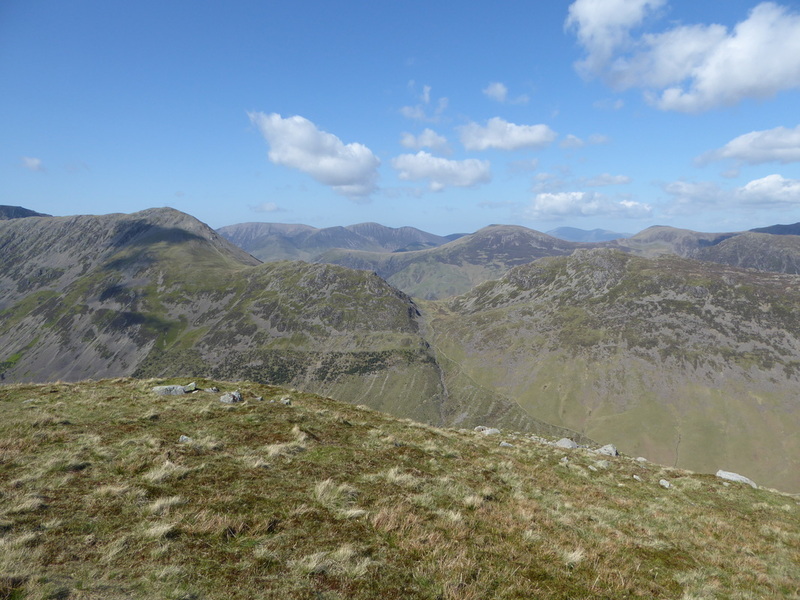 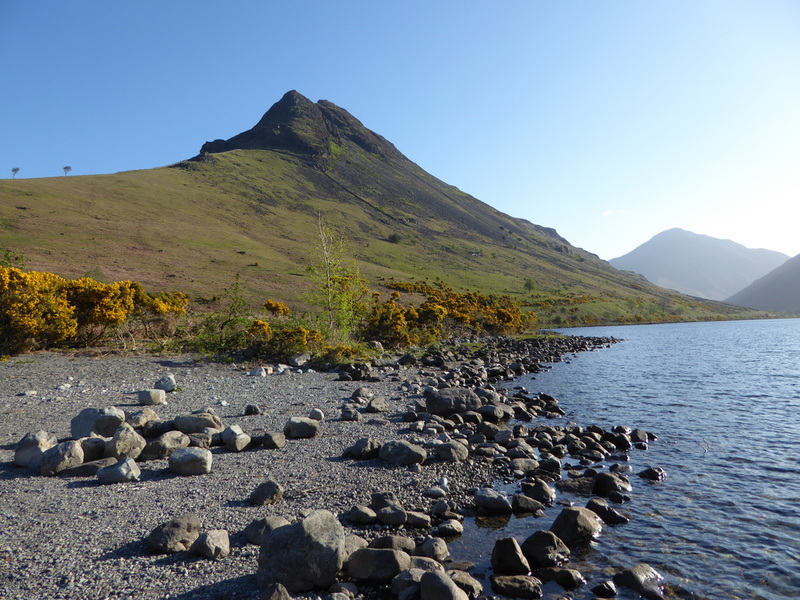 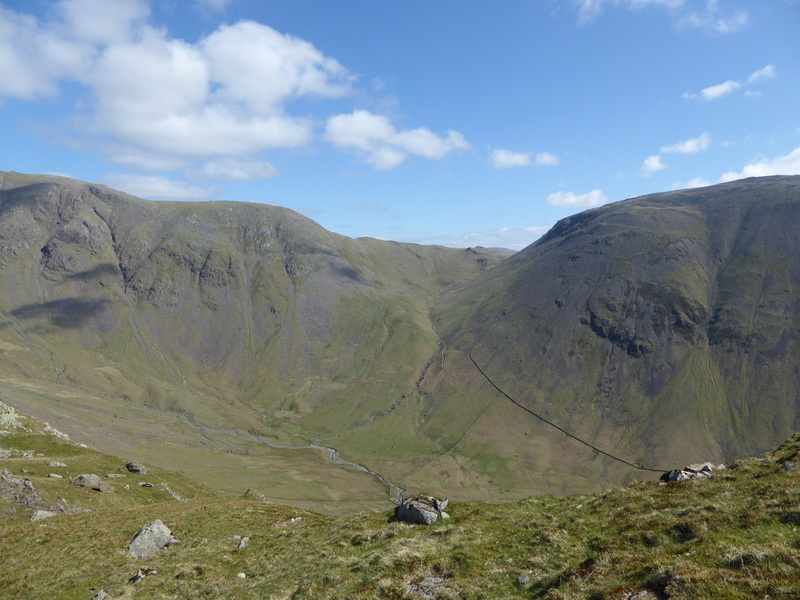 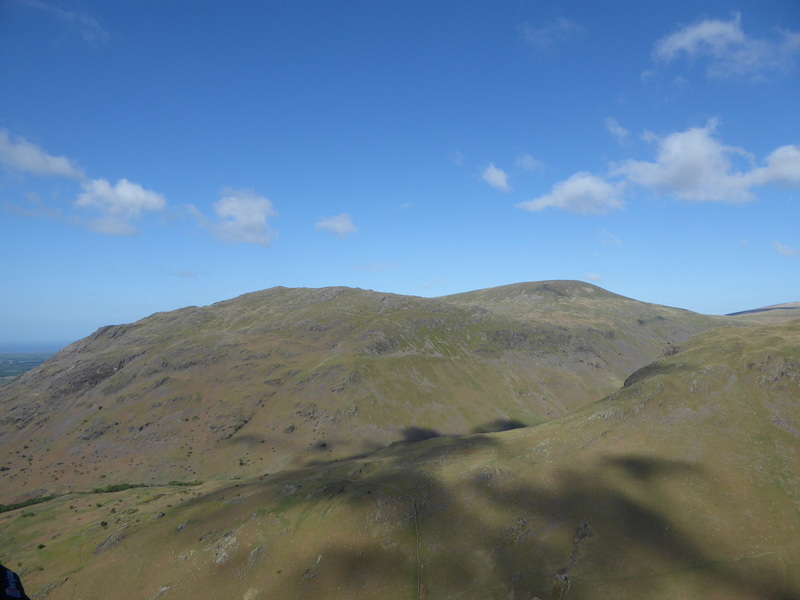 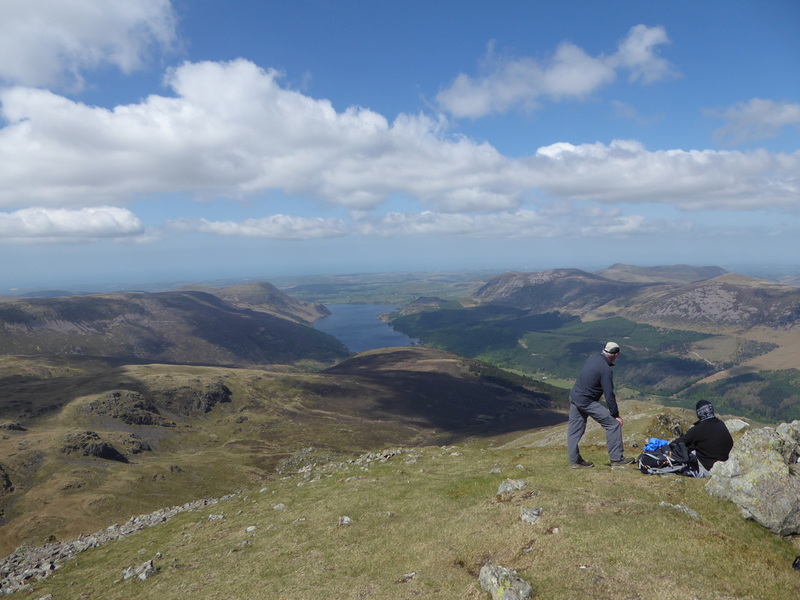 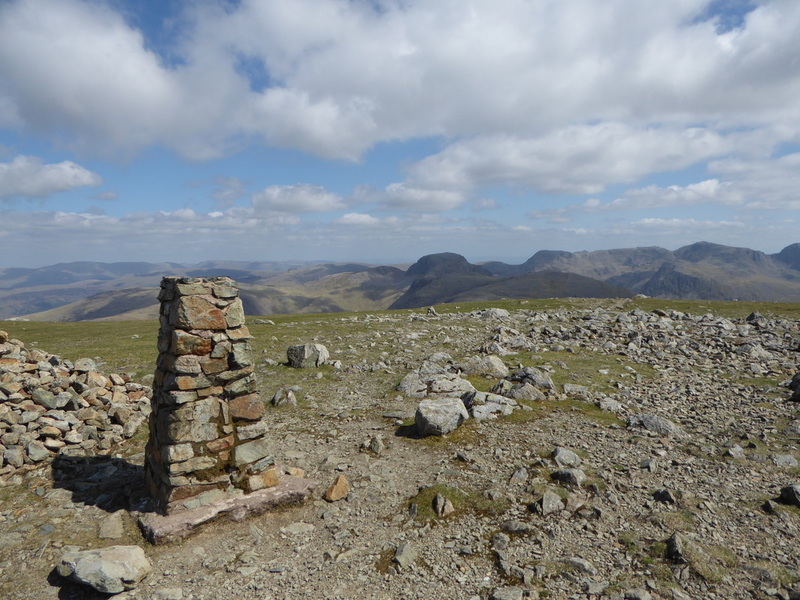 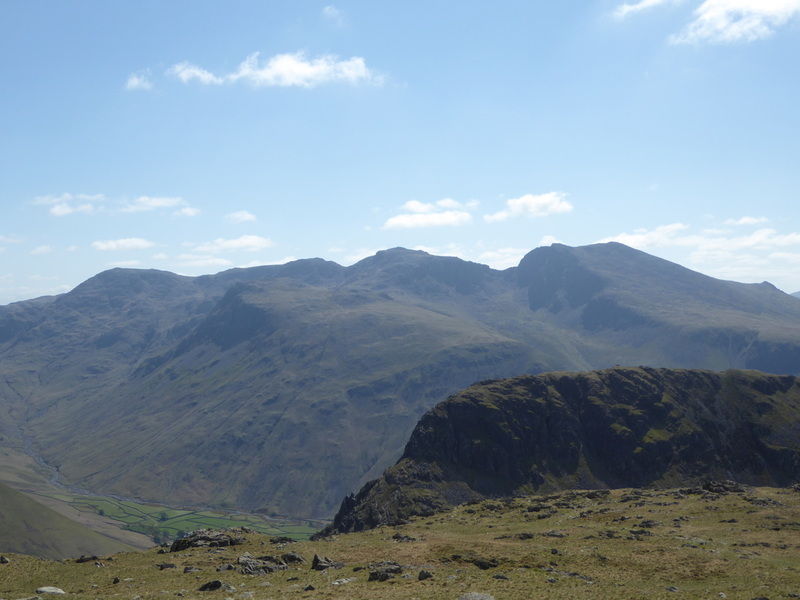 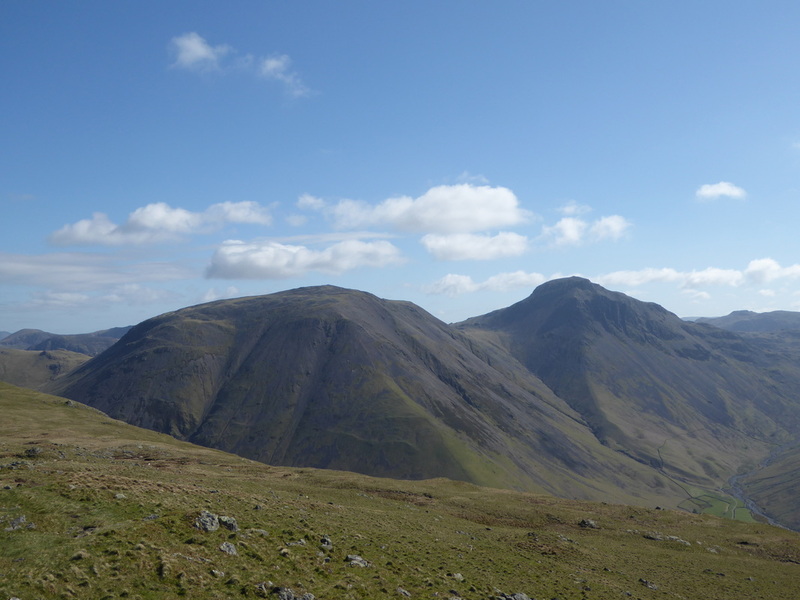 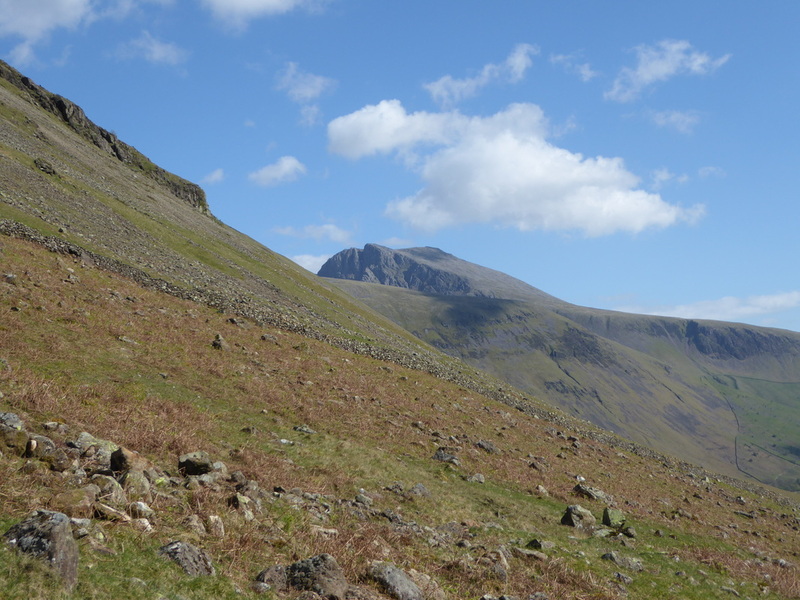 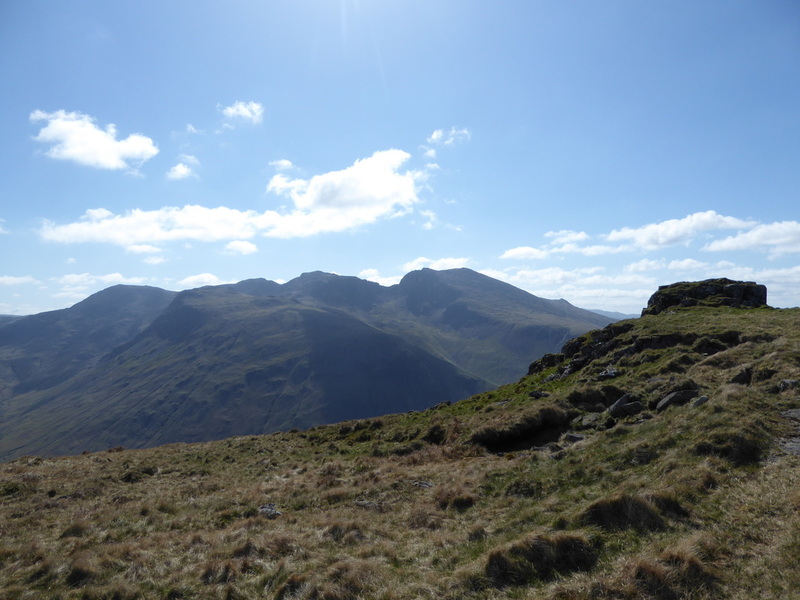 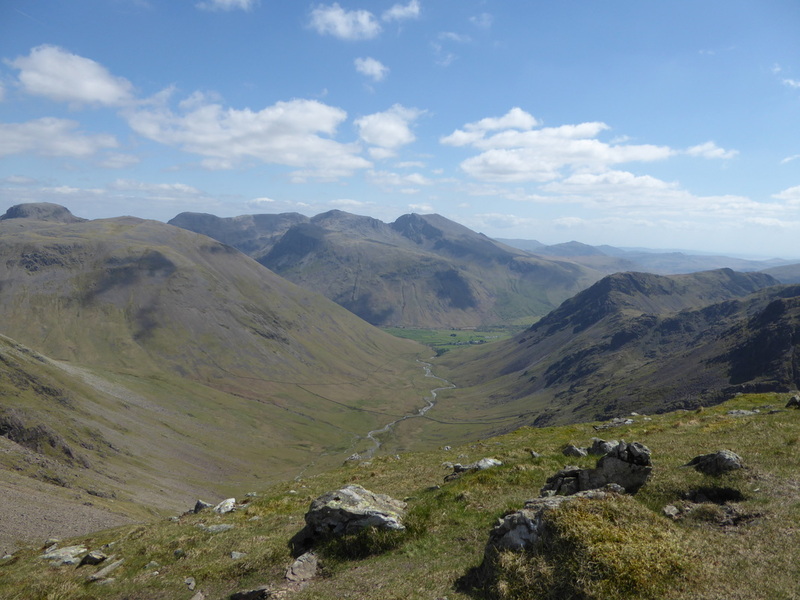 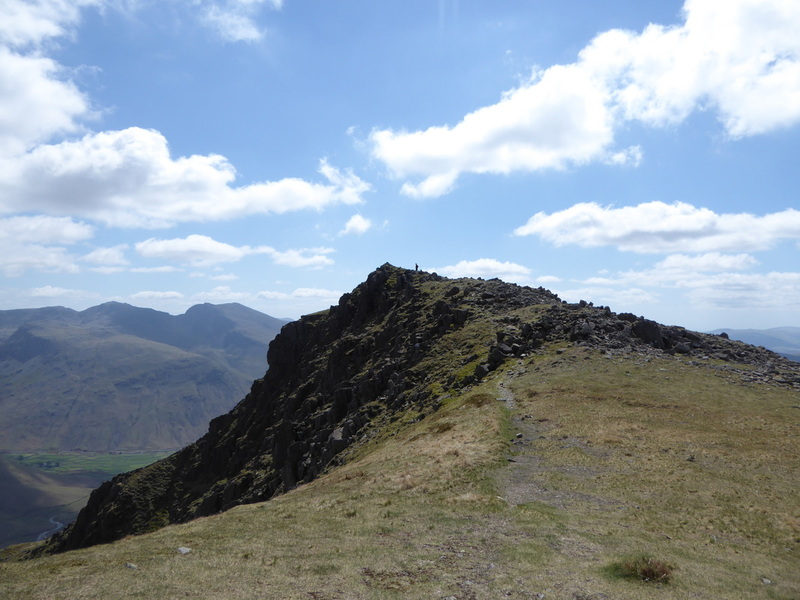 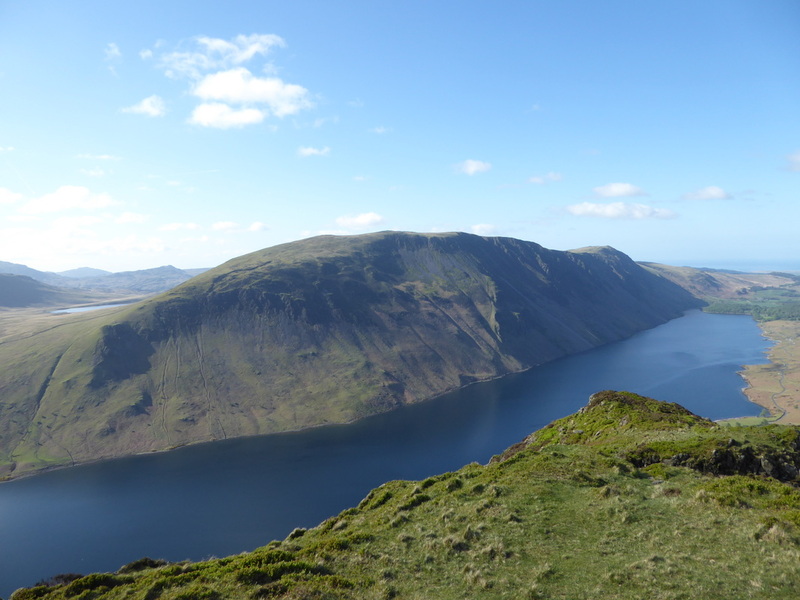 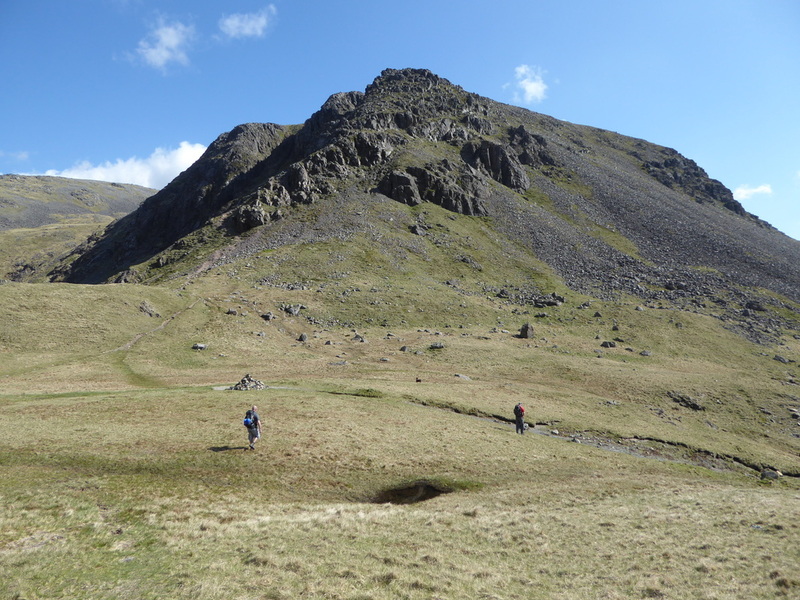 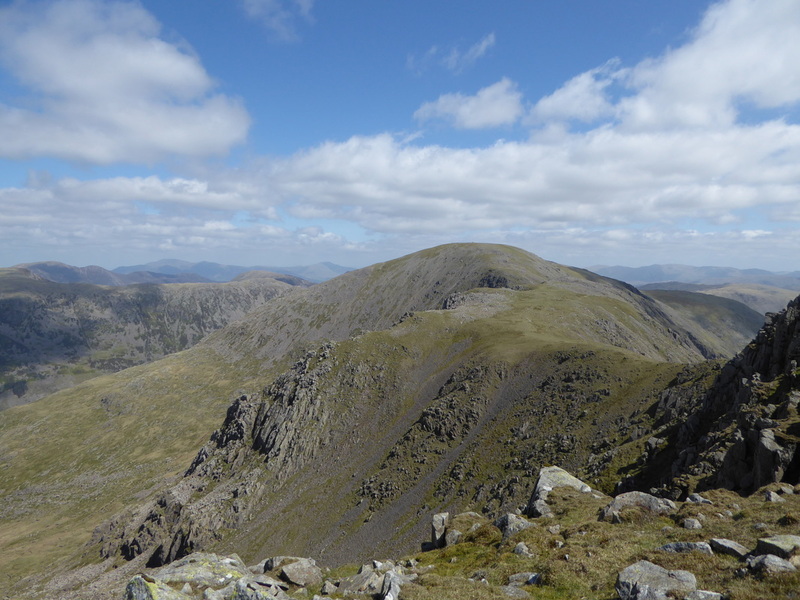 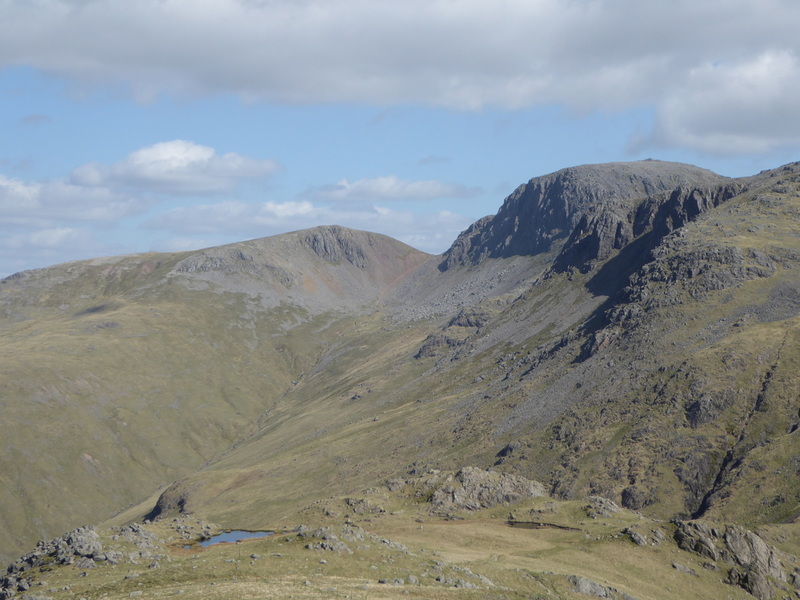 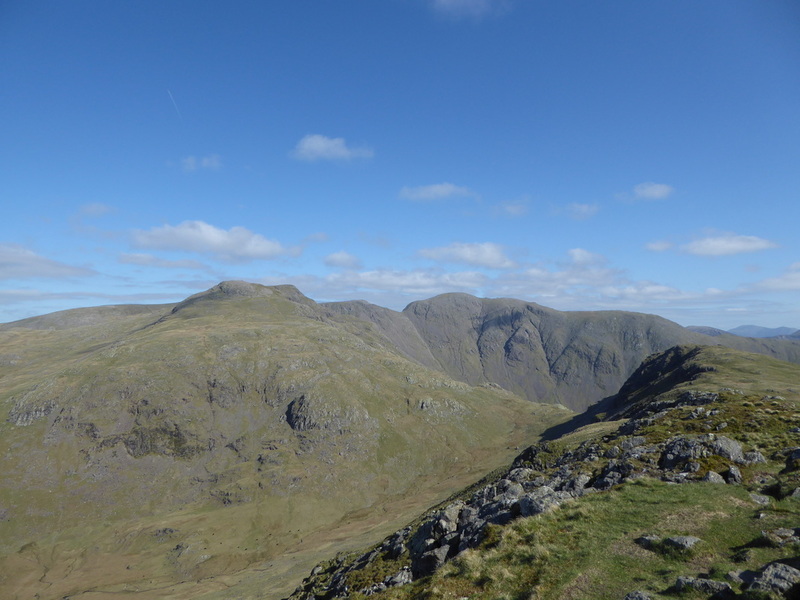 Very good mountain paths throughout although care needs to be taken on the ascent of Bell Rib on Yewbarrow and descending Stirrup Crag to Dore Head. 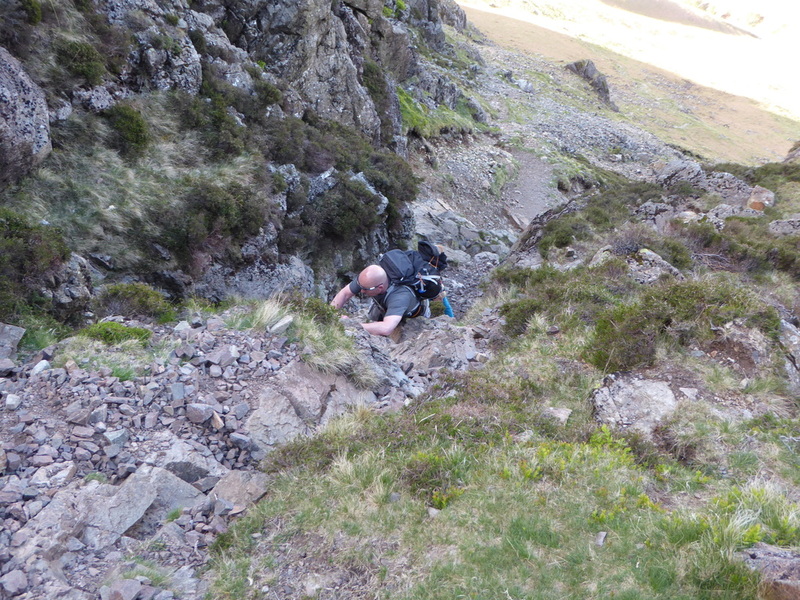 Both ascent and descent require careful but not difficult negotiation over loose stone. 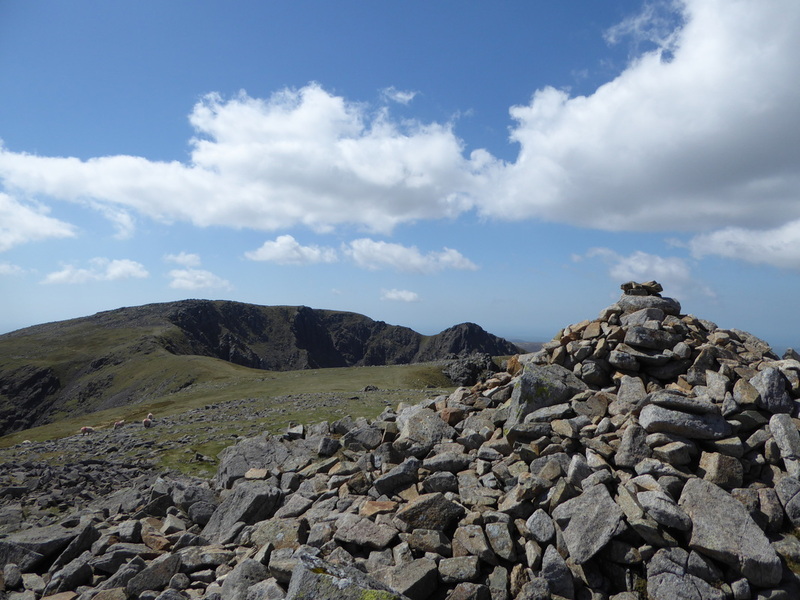 Sunny with very good visibility. 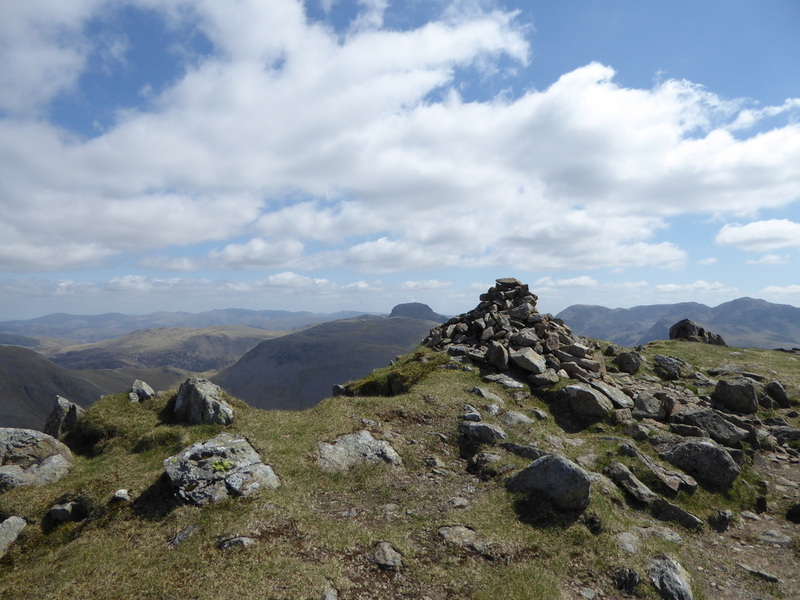 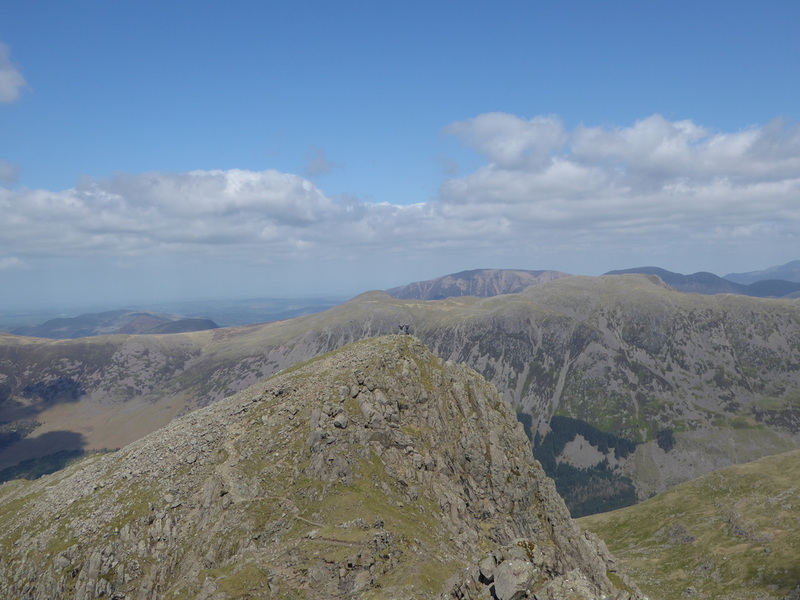 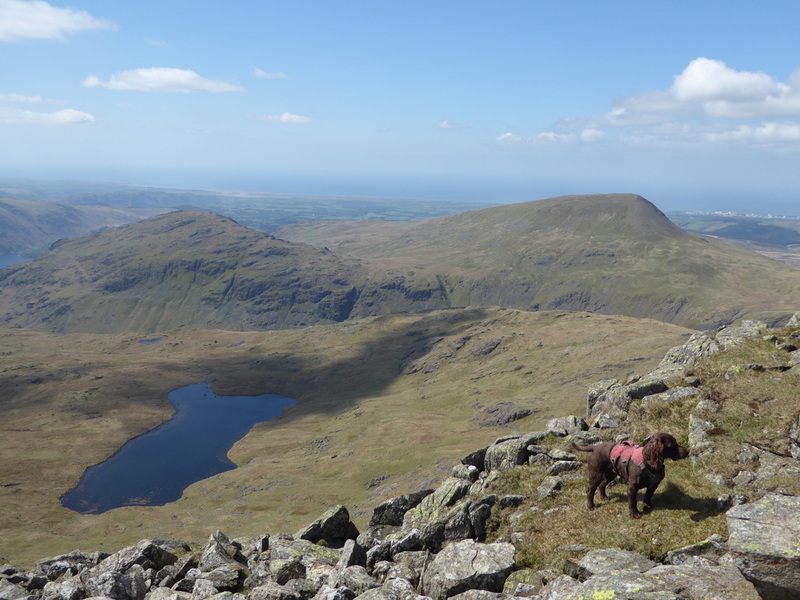 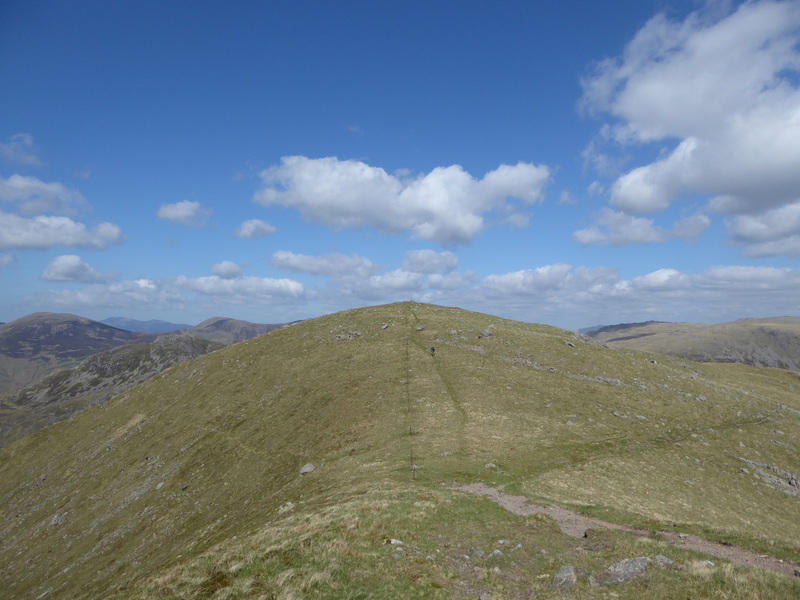 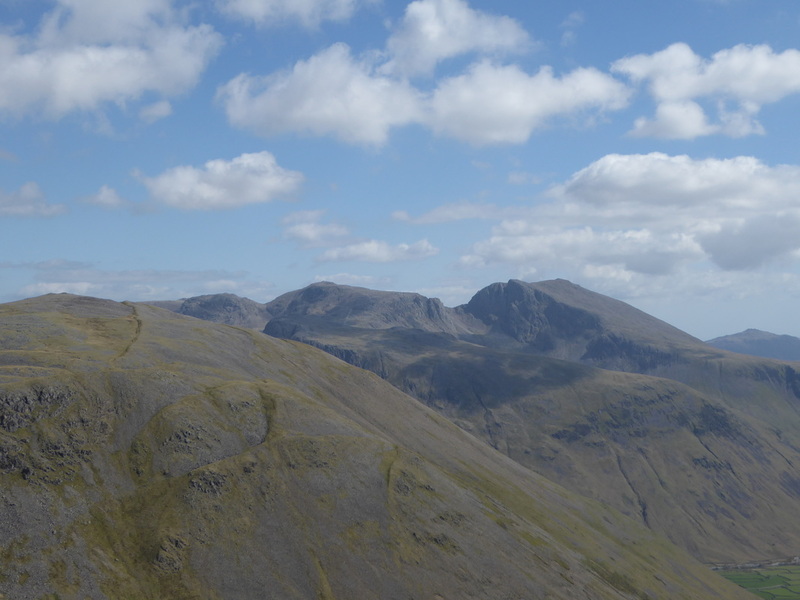 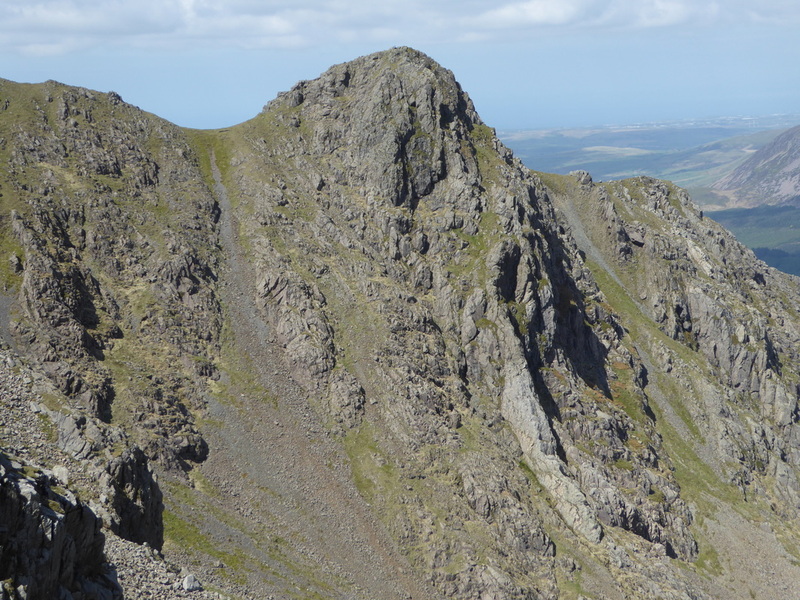 Occasional light to strong breezes and chilly on the summits & ridges. 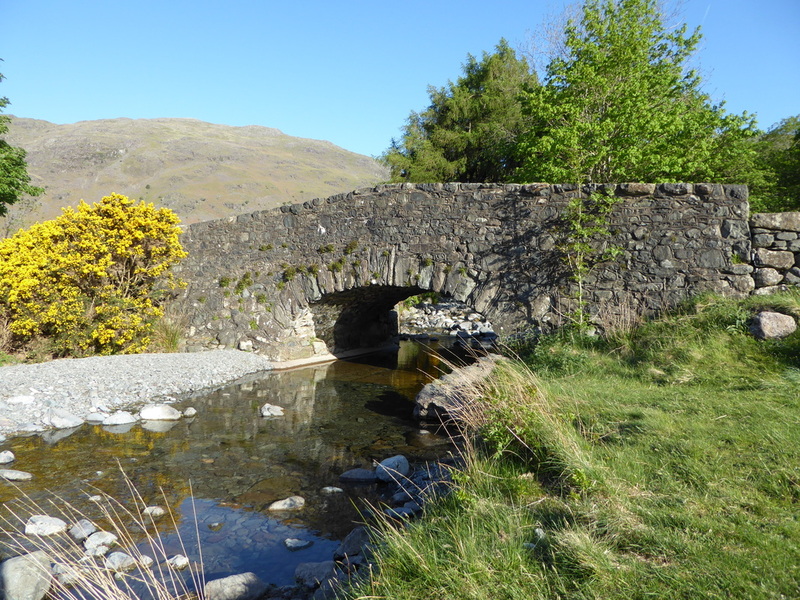 The walk started from the Car Park at Overbeck Bridge and we were there nice and early as this area can fill up pretty quickly. 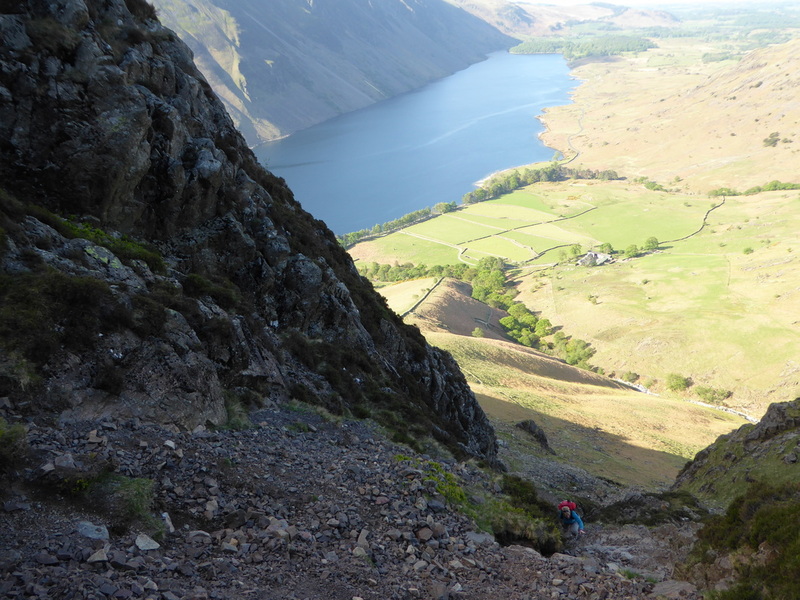 Leaving Overbeck, the journey up to Yewbarrow climbed steeply most of the way up therefore we were soon huffing & puffing our way to the ladder stile below Dropping Crag. 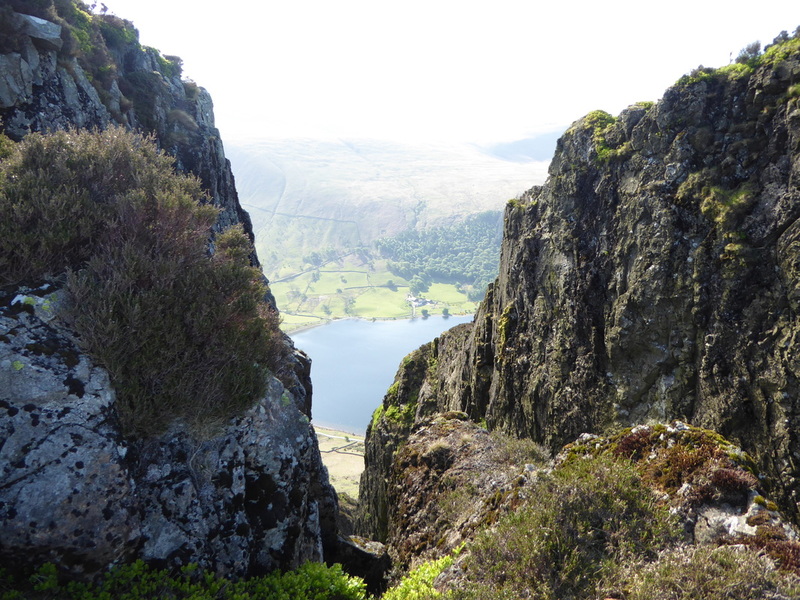 Once over the stile, the gradient eased before the path steepened again as it zig zagged to the start of the scramble to Bell Rib & Great Door. 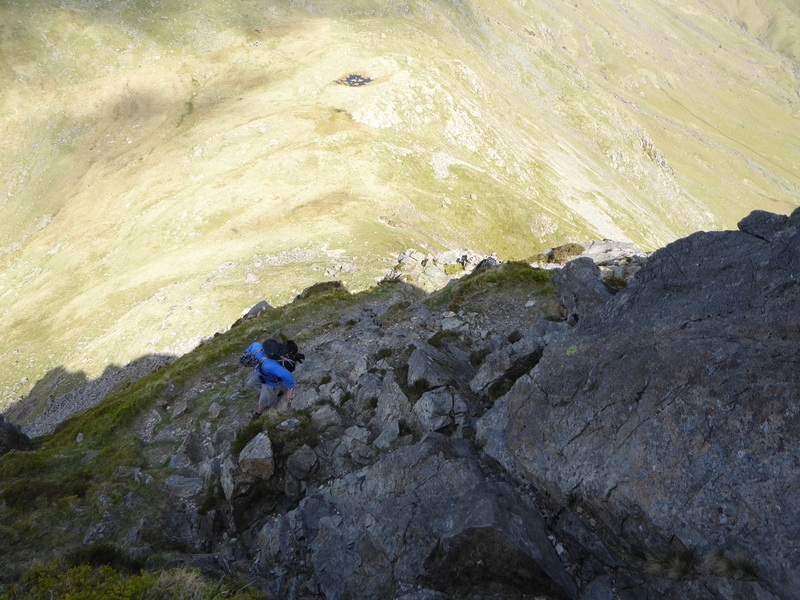 Much is made of the climb to gain Bell Rib - there are a couple of sections where we needed to get our hands on the rock but in good conditions it is an enjoyable scramble. 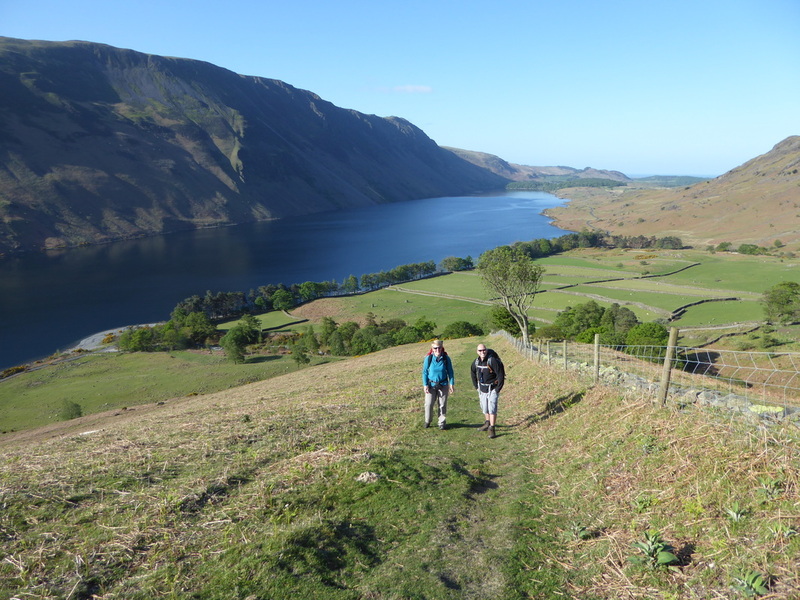 The path is steep but we just took our time and stopped frequently to enjoy the superb views back over to Seatallan & Wastwater. 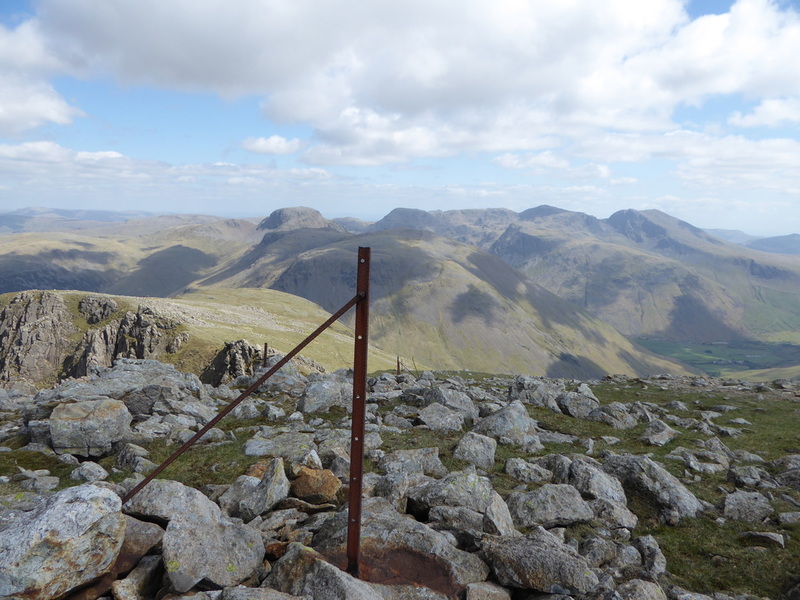 At the top of the gully we reached the superb rock portal of Great Door which gives a fantastic view of the Scafell massif - photography was difficult here today though as the sun was shining above The Scafells and therefore right into the lens. 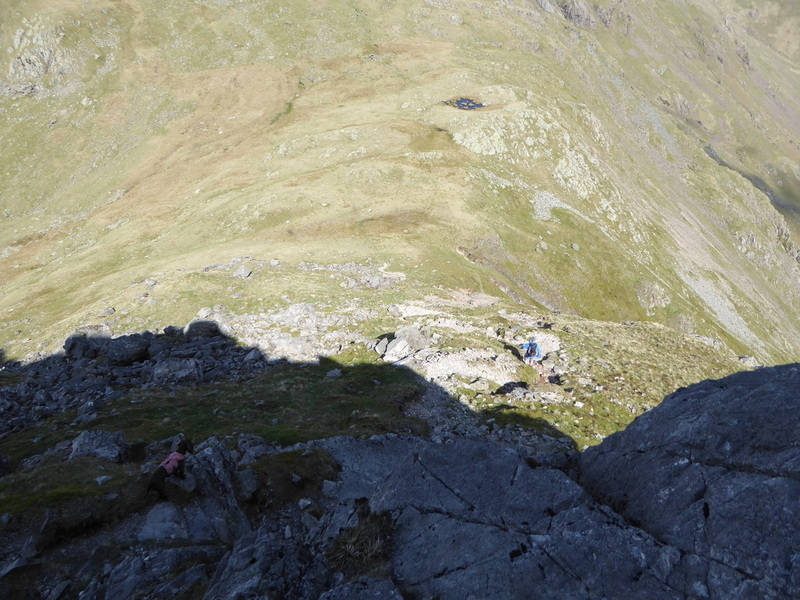 We have been to Great Door a few times now and it is always a "mouth open" moment when you see it again. 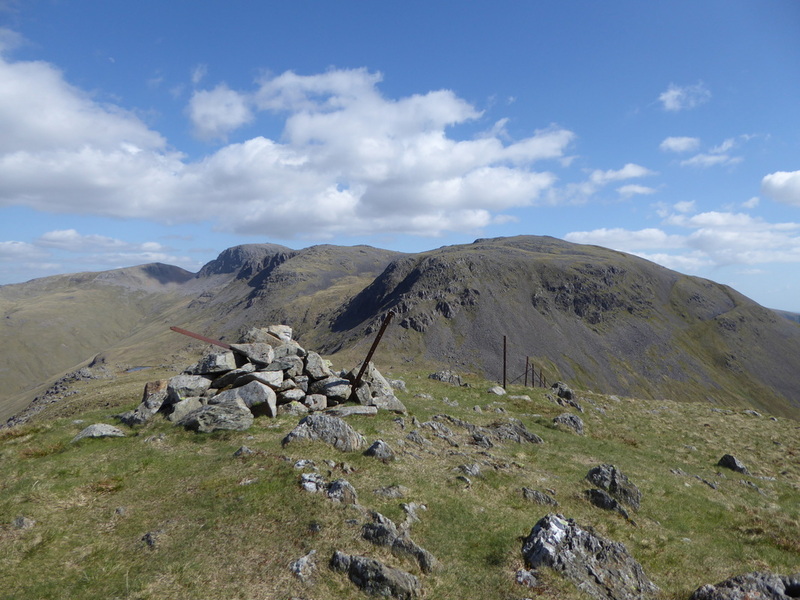 From Great Door there was still work to do before reaching Yewbarrow's south summit and we transited steeply up to Bull Crag before the path levelled out and the summit cairn came into view. 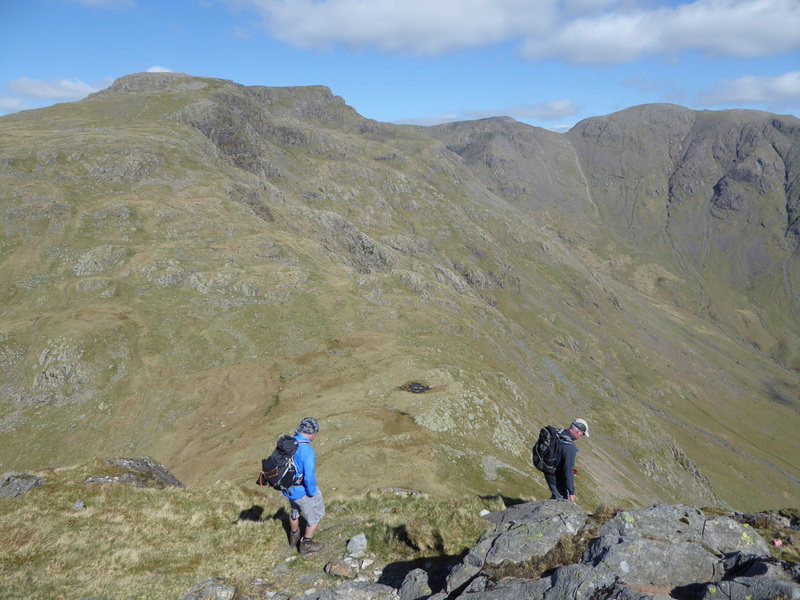 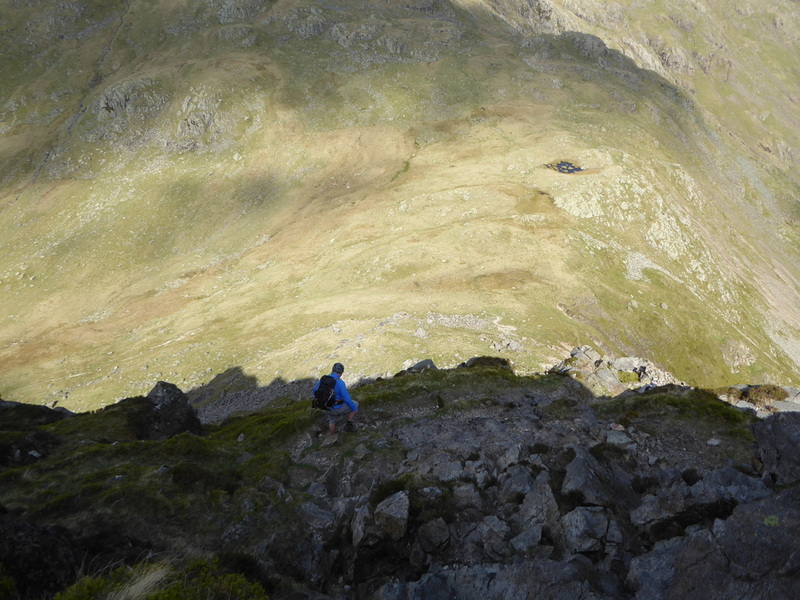 The transit from South Top to the North Top was pretty level going and we were soon making the descent off the fell to Dore Head via Stirrup Crag. 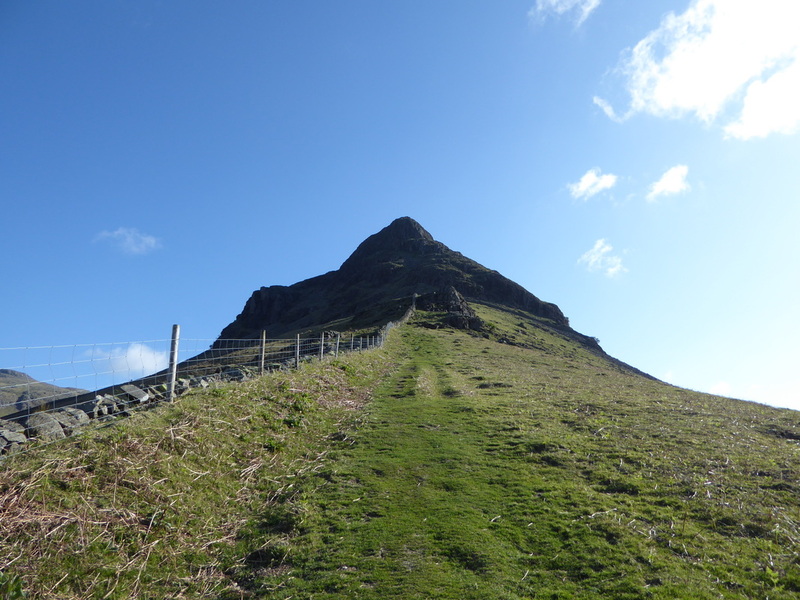 Much is made about the descent of Stirrup - it is tricky but it is simply a question of taking ones time and watching where you put your feet. 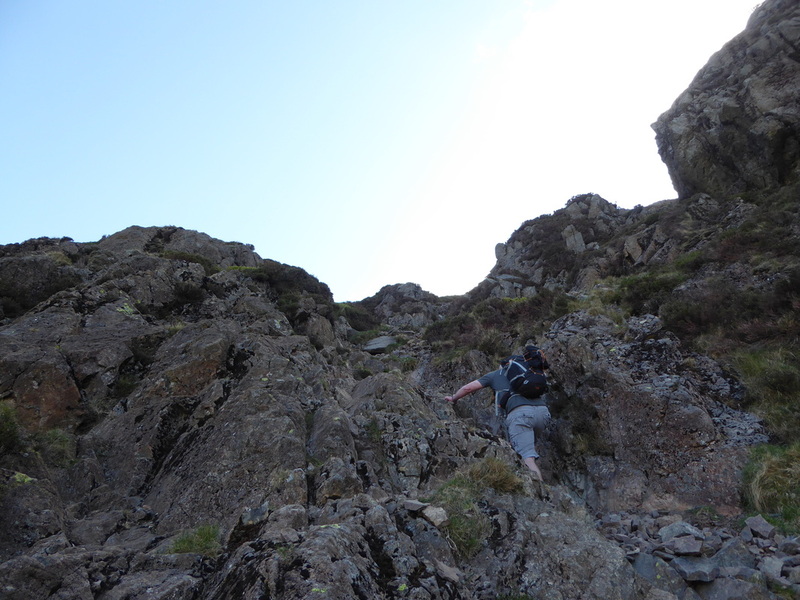 We have been both up and down Stirrup Crag now and it is a joyful scramble both ways. 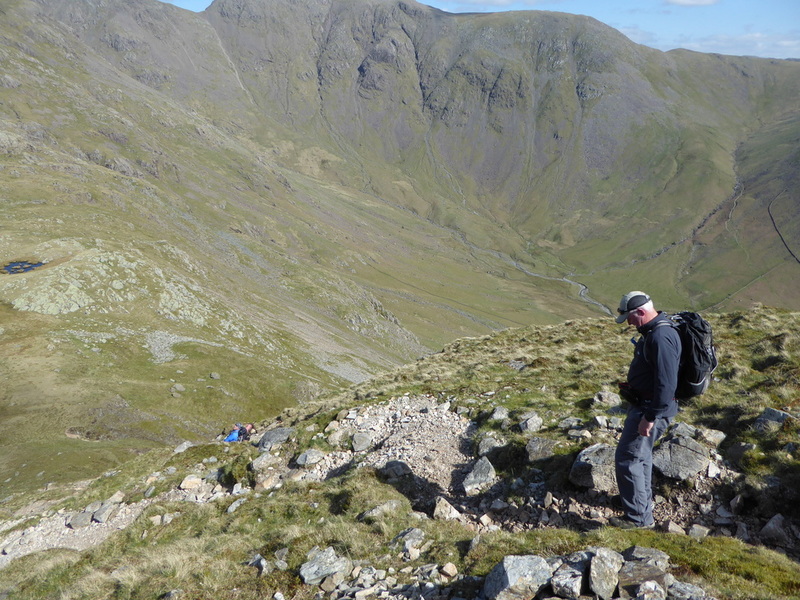 Reaching Dore Head we had a quick look down the Screes into Mosedale before making our way to the foot of Red Pike. 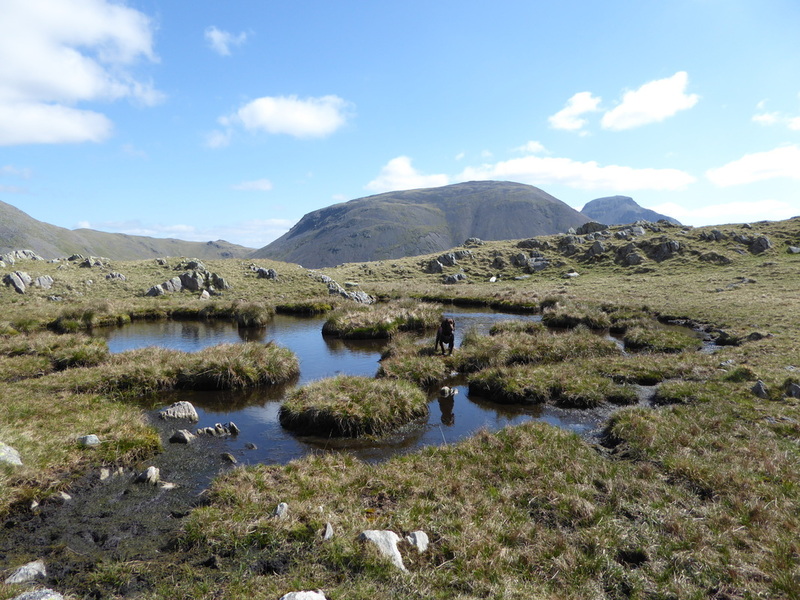 The route up is a steady ascent and we diverted to the Chair Cairn which grants amazing views over to Low Tarn, Middle Fell & Seatallan. 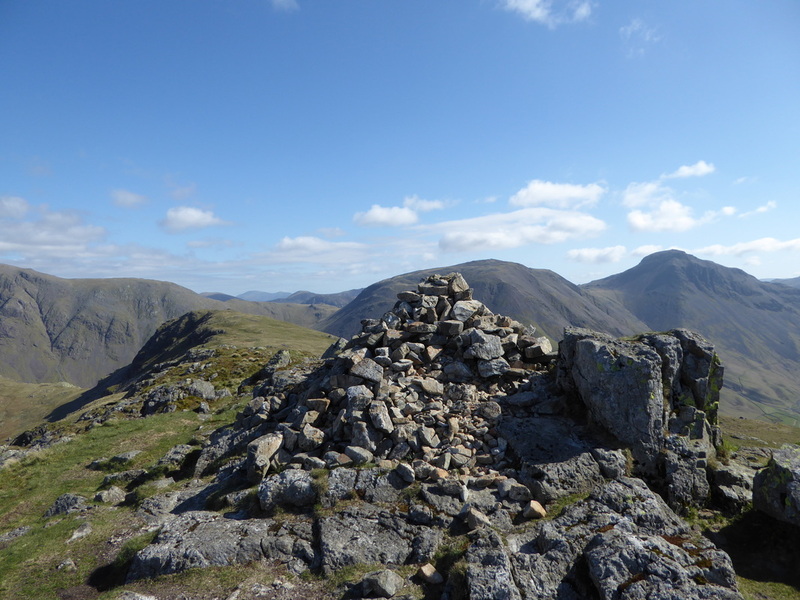 From the Chair there was a short transit to the summit proper where the cairn sits right on the edge of the Mosedale Crags. 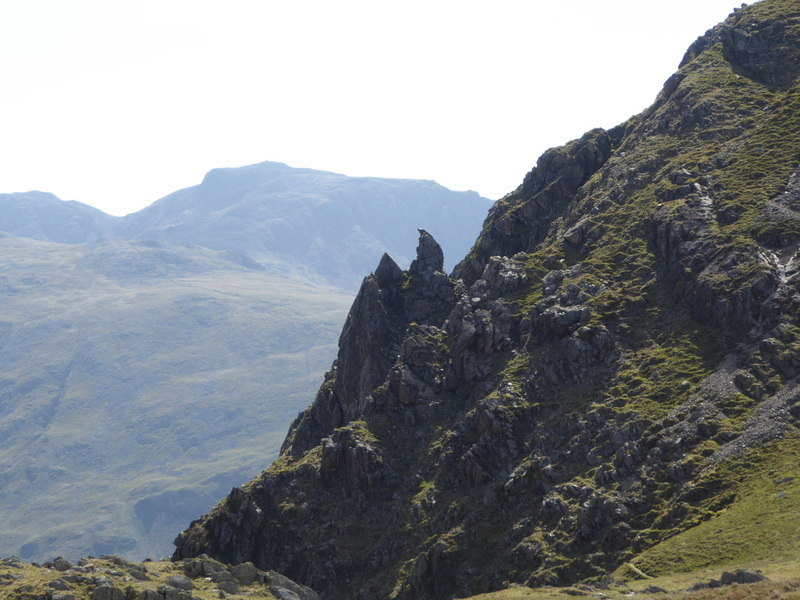 The view from here is just breathtaking. 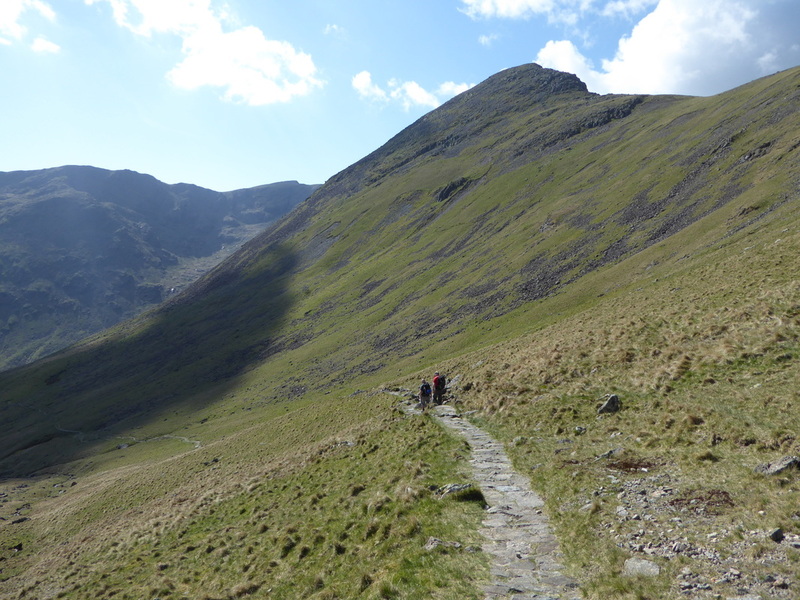 Leaving Red Pike there is a gradual descent before the path inclines to the right to head over towards Black Crag. 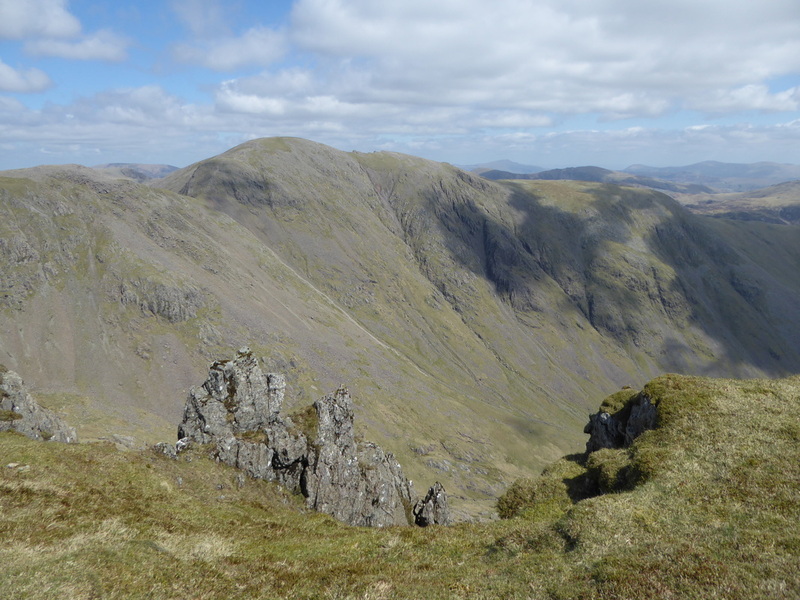 Above Mirk Cove it was time to turn left to make the short pull up to Scoat Fell with Steeple clearly visible. 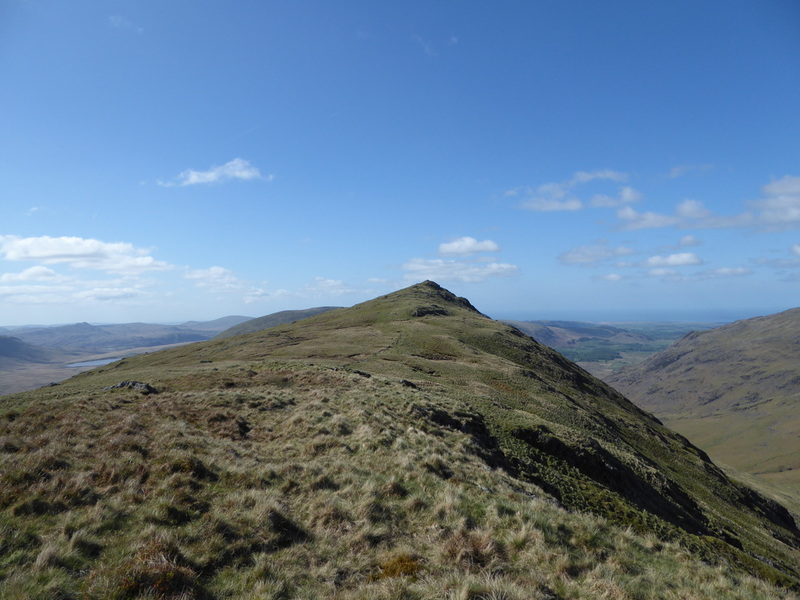 From Scoat Fell it was a short out and back to Steeple's summit which gave us superb views down into Ennerdale and over to the High Stile ridge. 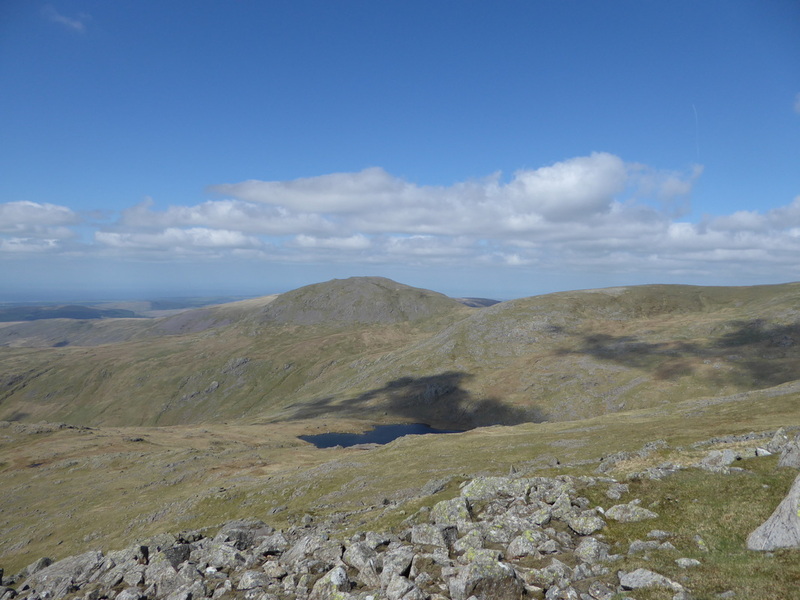 Arriving back at Scoat Fell and tempted as we were to nip over to Haycock, we headed off towards Black Crag from where we enjoyed a superb transit over Wind Gap and then a steep pull up to the plateau summit of Pillar. 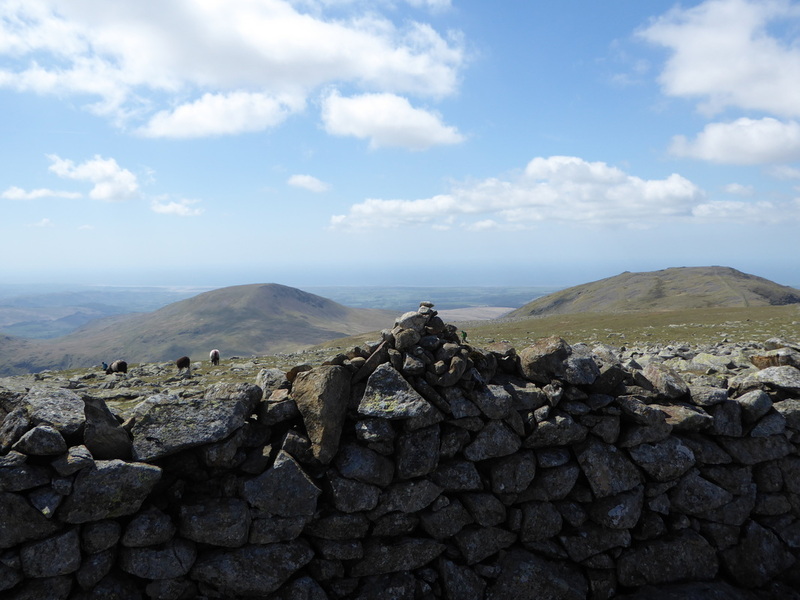 Surprisingly enough, it was not too busy on the summit of this fantastic mountain and from the trig point we made the short trip to the north to look down to the imposing Pillar Rock and the route down to Robinson's Cairn. 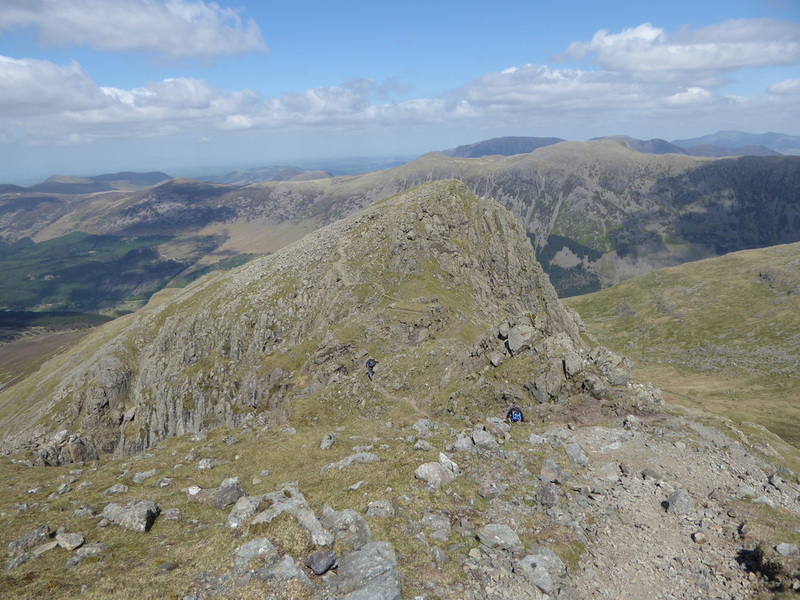 Returning to the summit there was now a long and undulating journey (mainly down!) 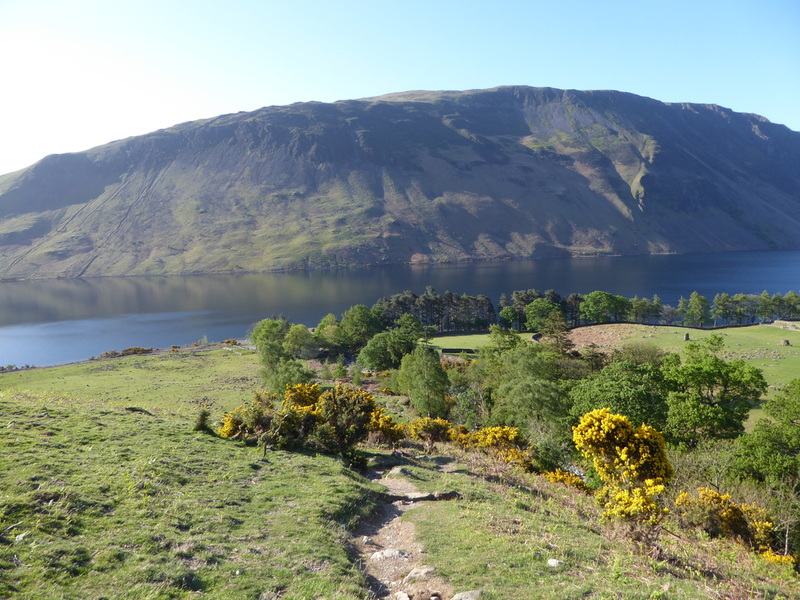 over to Looking Stead from where there are superb views back to Pillar and Ennerdale and also down to the Youth Hostel at Black Sail. 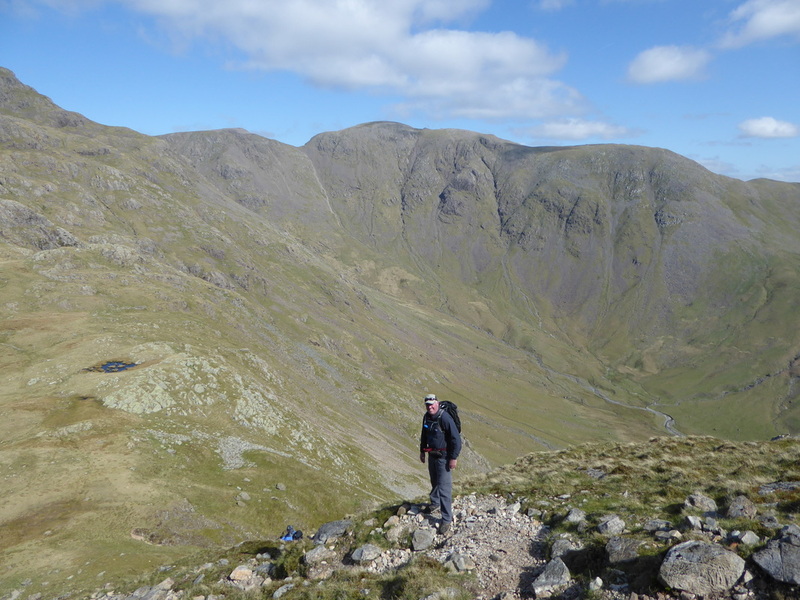 Reaching the top of the Black Sail Pass, it was now time to make the decision whether we were feeling up to going over Kirk Fell and on to Great Gable, returning via Sty Head. 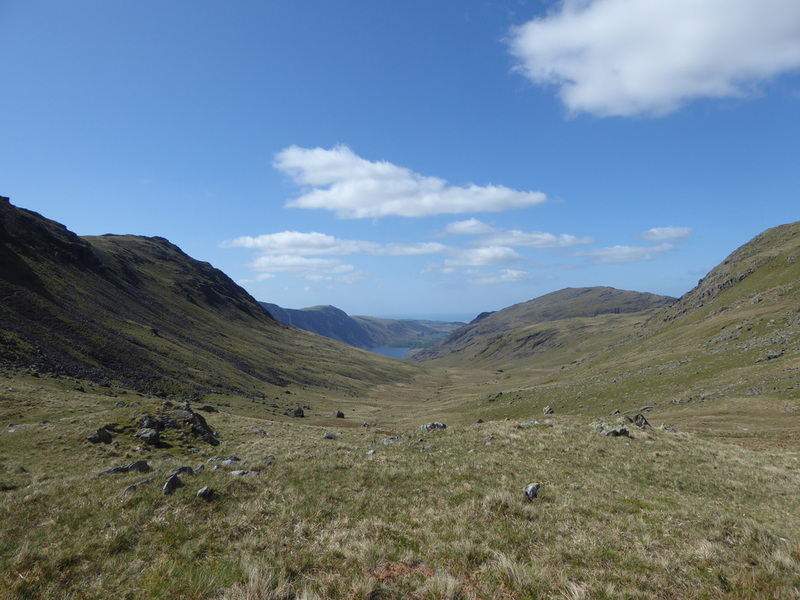 The opinion was that we had done enough today and we therefore headed down into Mosedale to make the long transit back to Wasdale. 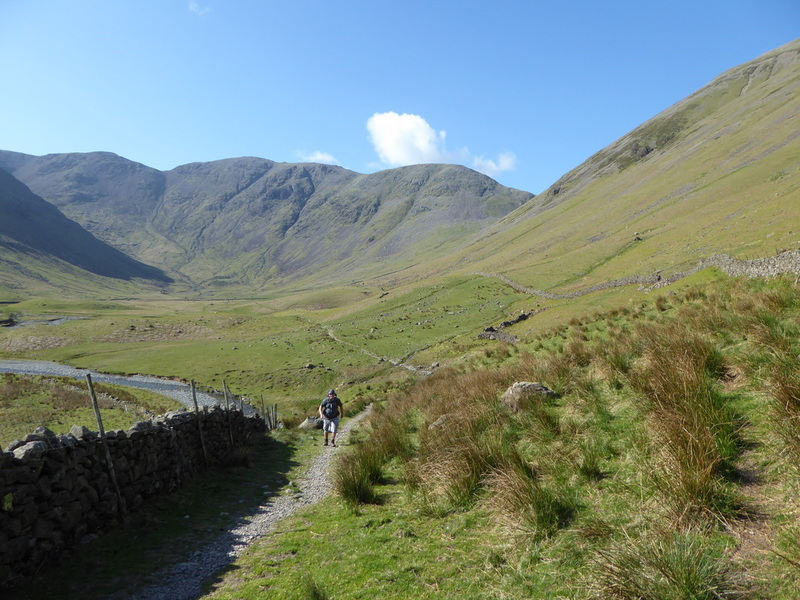 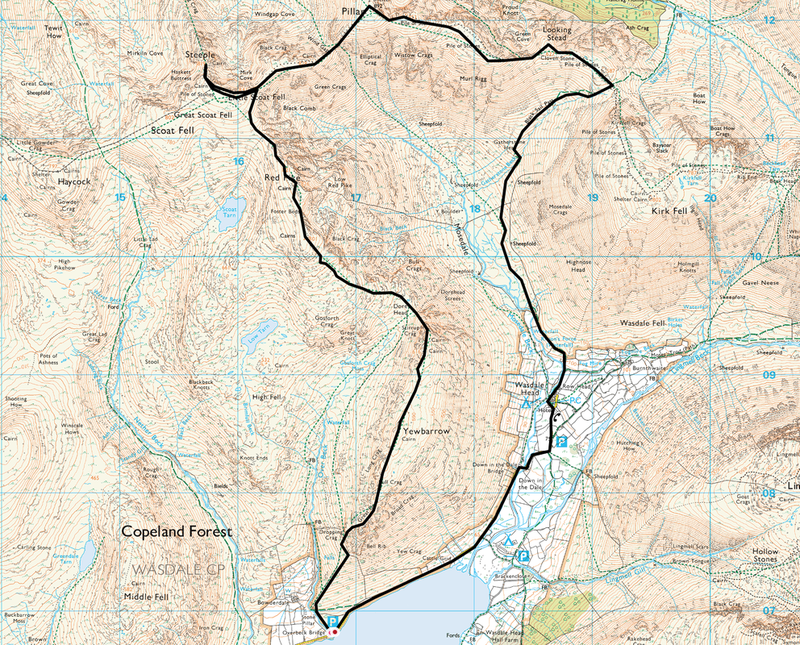 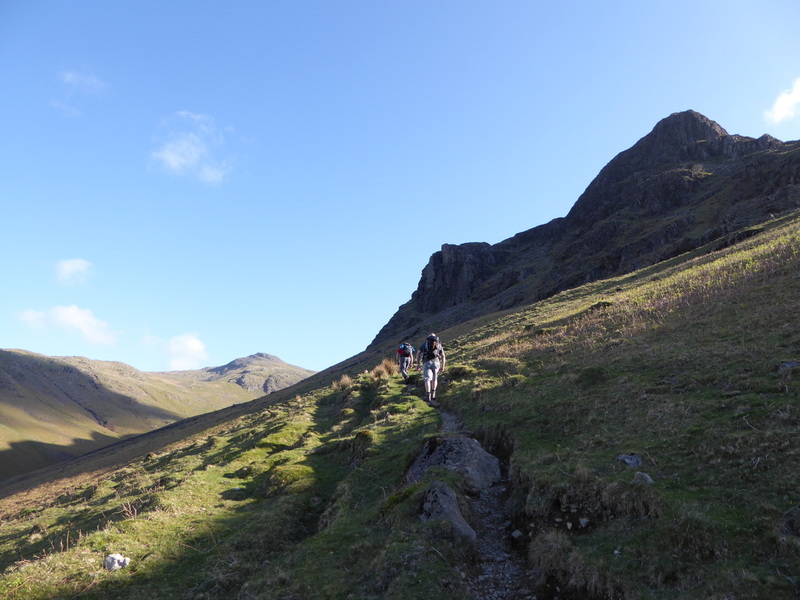 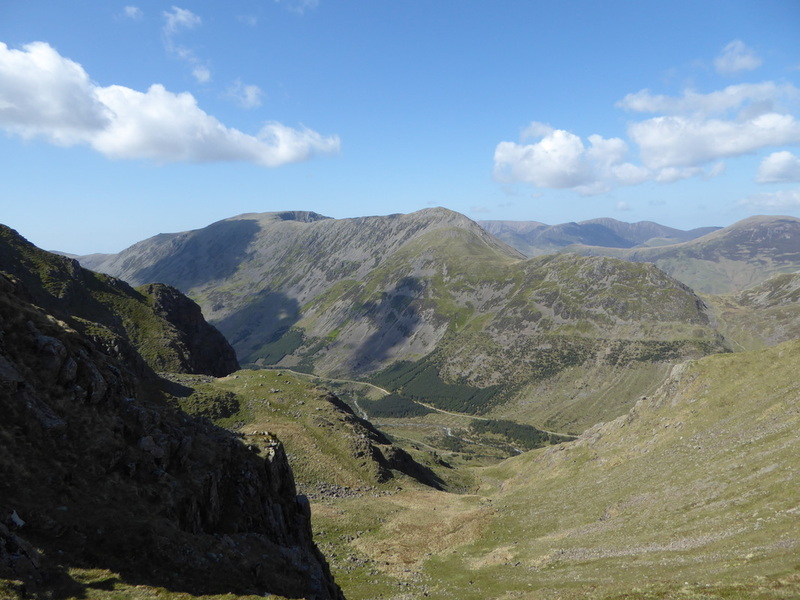 The route down through Mosedale is a true delight and should be enjoyed rather than endured. 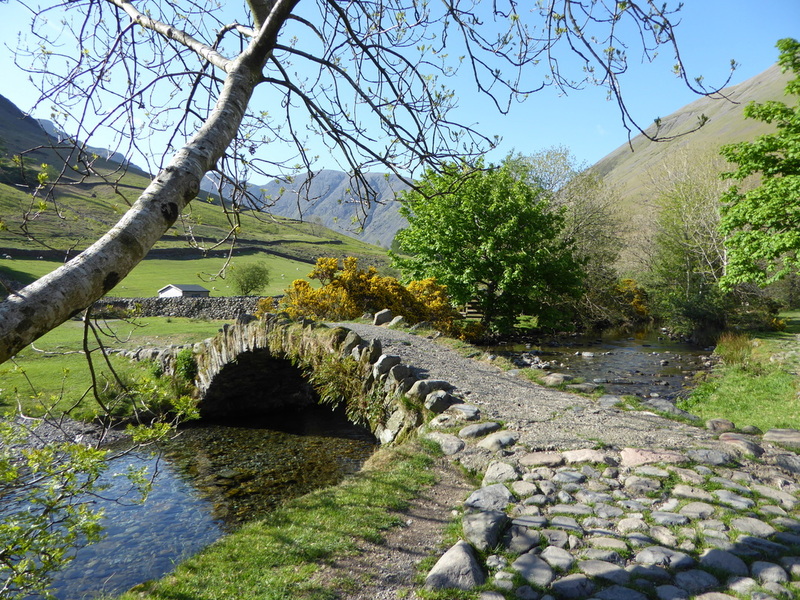 Eventually Wasdale Head was reached and passing behind Row Head we reached the old packhorse bridge and The Wasdale Head Inn. 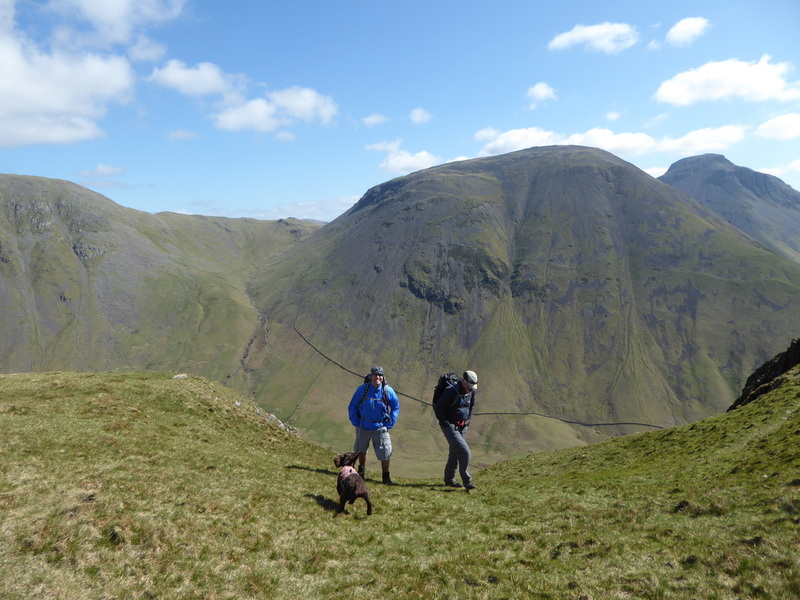 Jon, Angie & Fudge headed into the Inn whilst Dave made the mile or so transit back to Overbeck Bridge to pick up the car - the lone journey sweetened by the view to the Scafells and Wastwater. 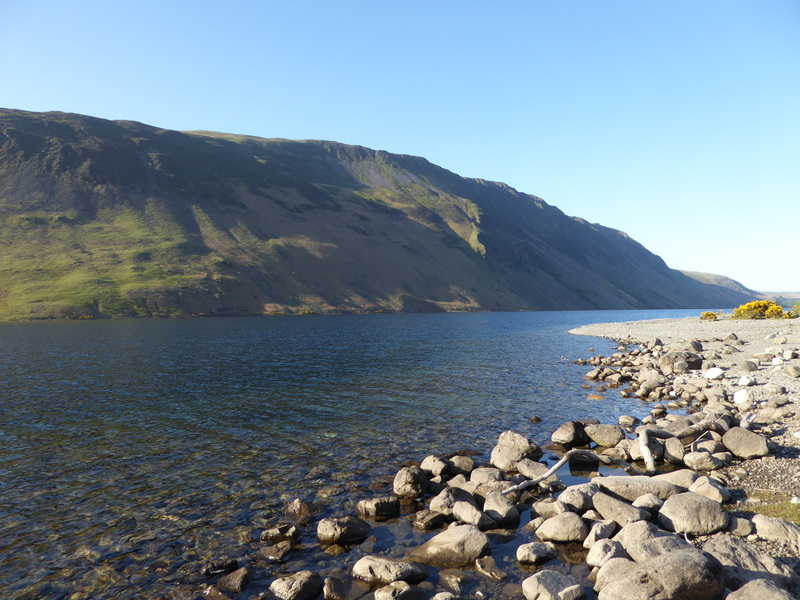 Back at the Inn, we enjoyed a superb meal and drinks which topped off a fine day in this beautiful & special part of the Lake District. 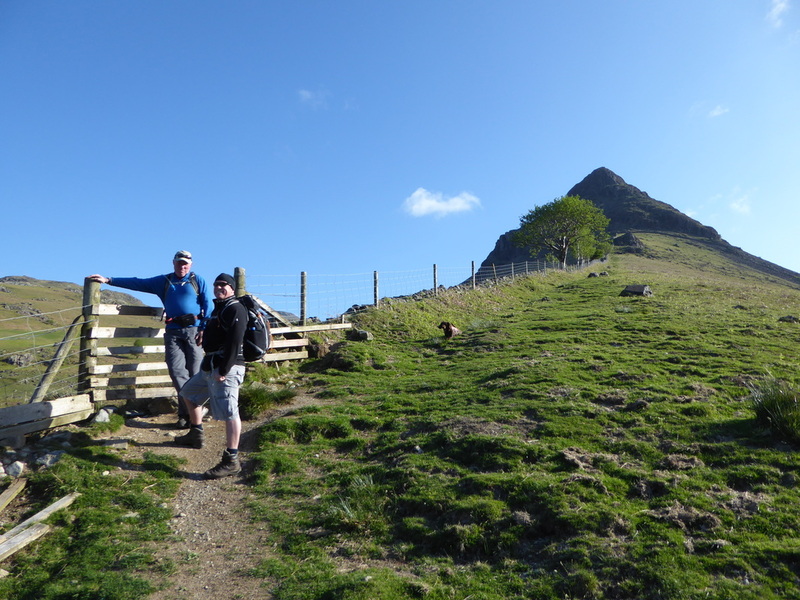 Once over the stile the path levels out for a while with only a gentle rise as we make a beeline towards Dropping Crag. 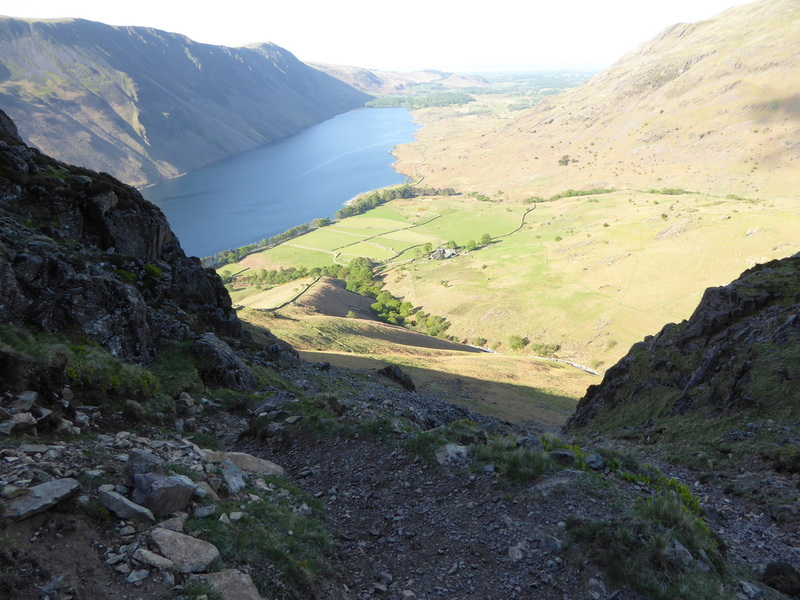 The view through Great Door - unfortunately the sun was shining through the letterbox!! 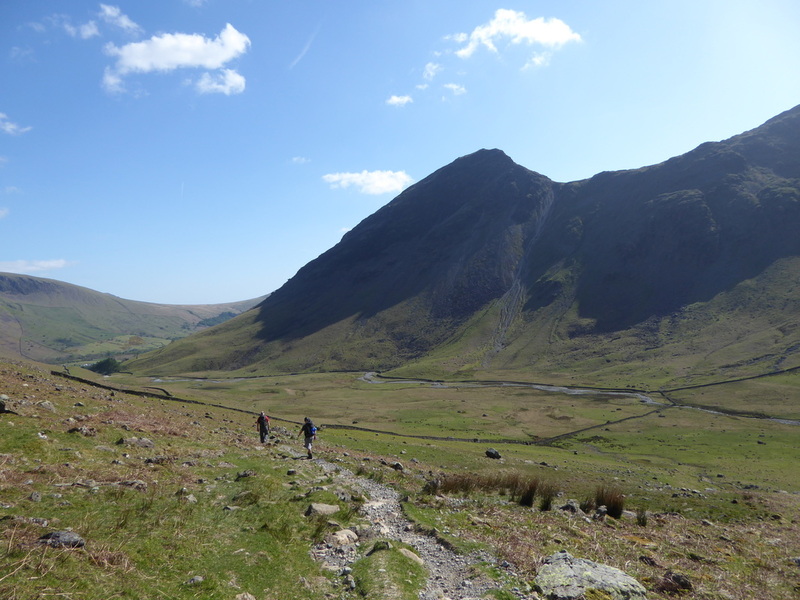 0900 on a Saturday Morning - doesn't get much better than this does it? 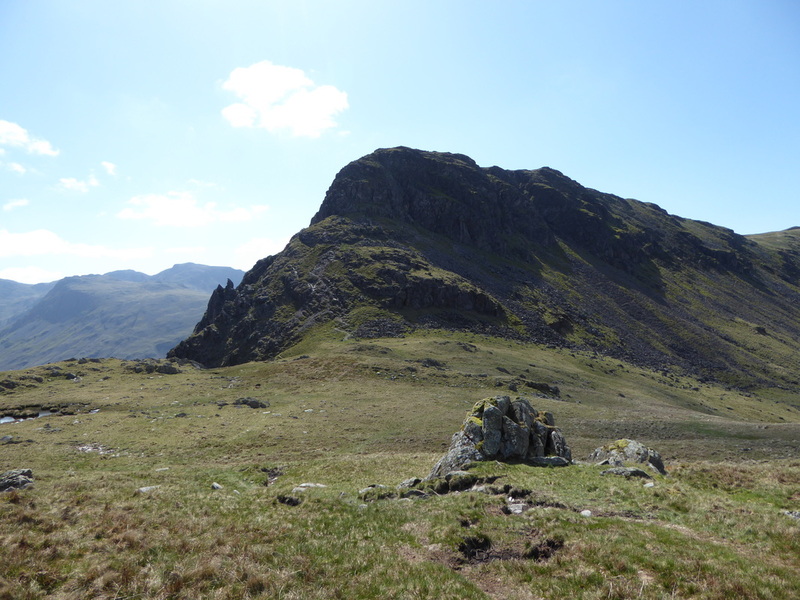 Much is made of the descent of Stirrup Crag down to Dore Head - providing you take your time and in the right conditions it is fine. 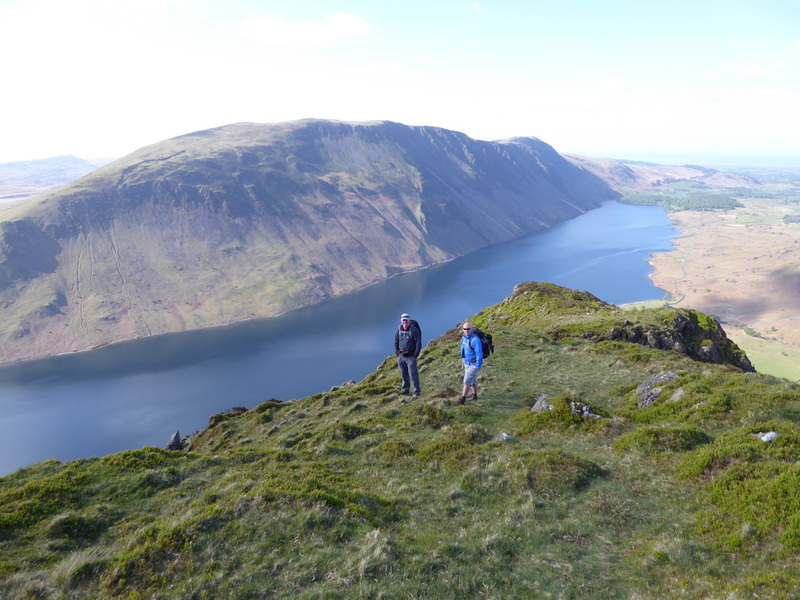 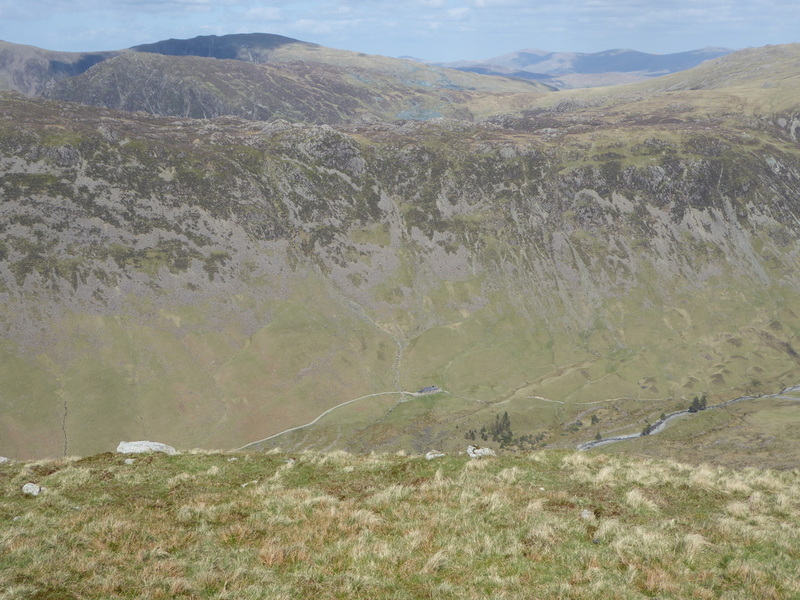 I had just shown Jon the steep drop off into Mosedale down near the Dore Head Screes. 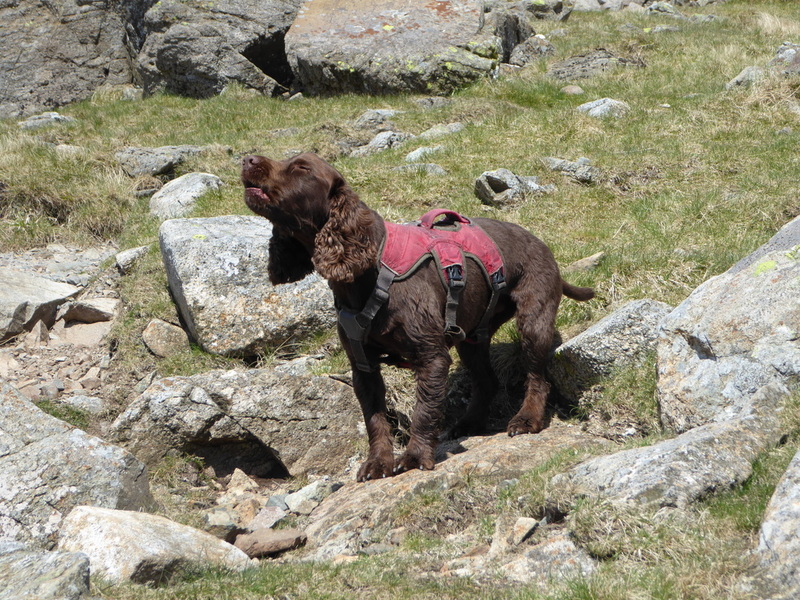 He is smiling because I told him we were off to Red Pike next and not down the scree path!! 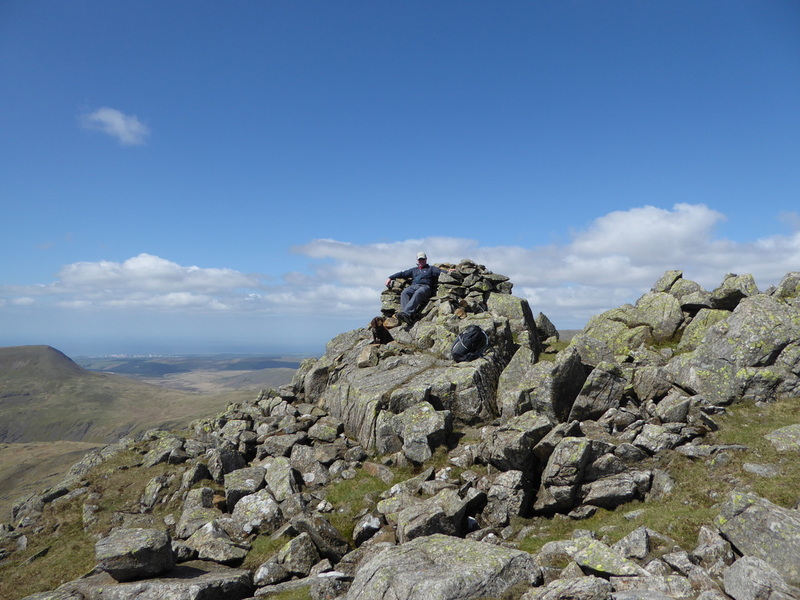 The Chair Cairn near Red Pike's summit - all I was missing was a bottle of beer!! 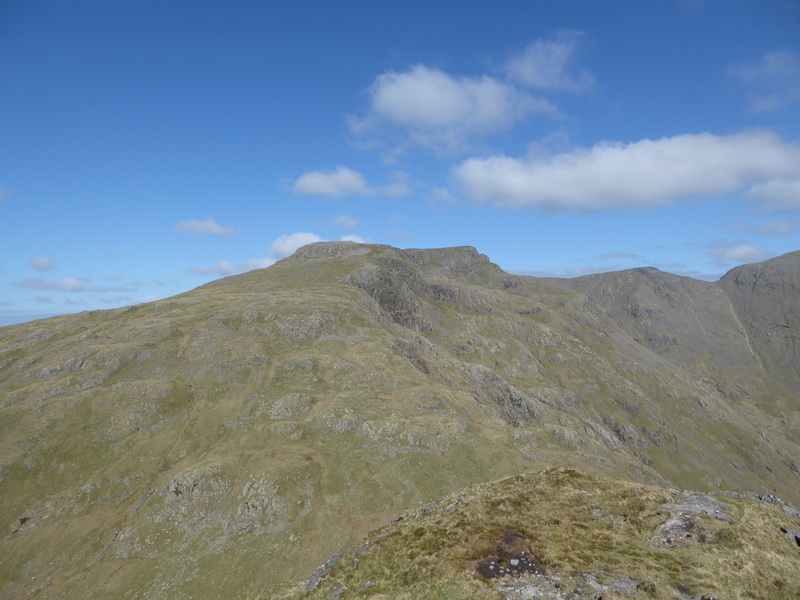 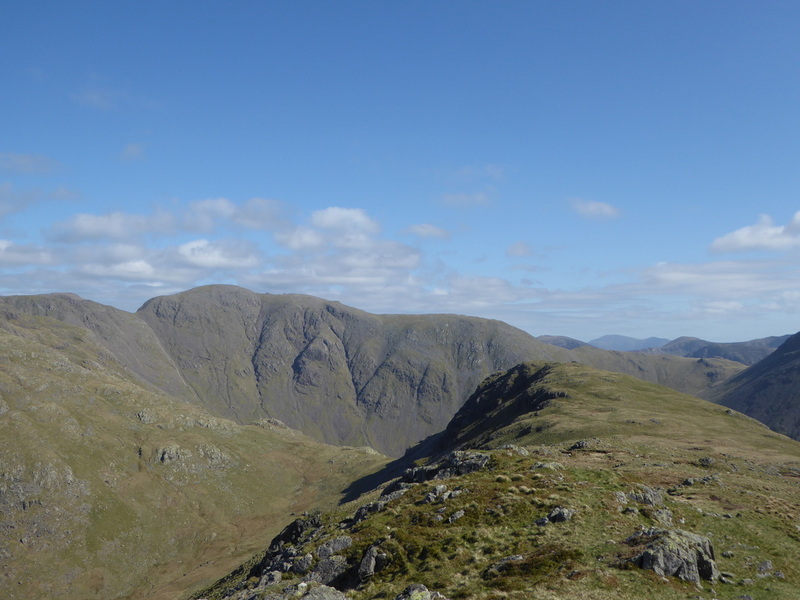 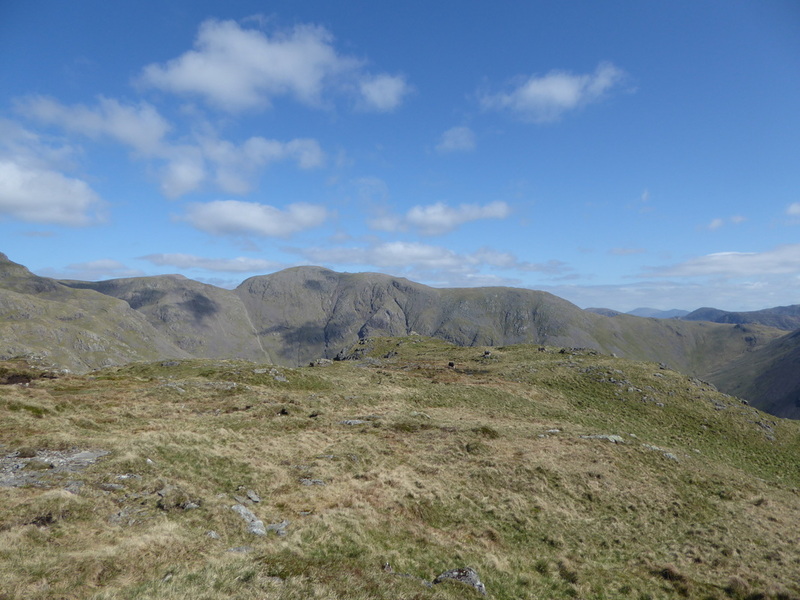 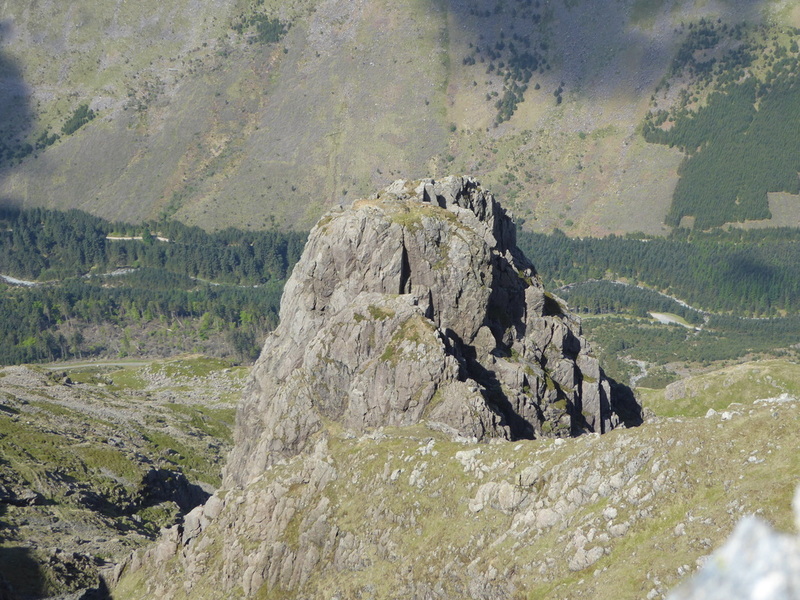 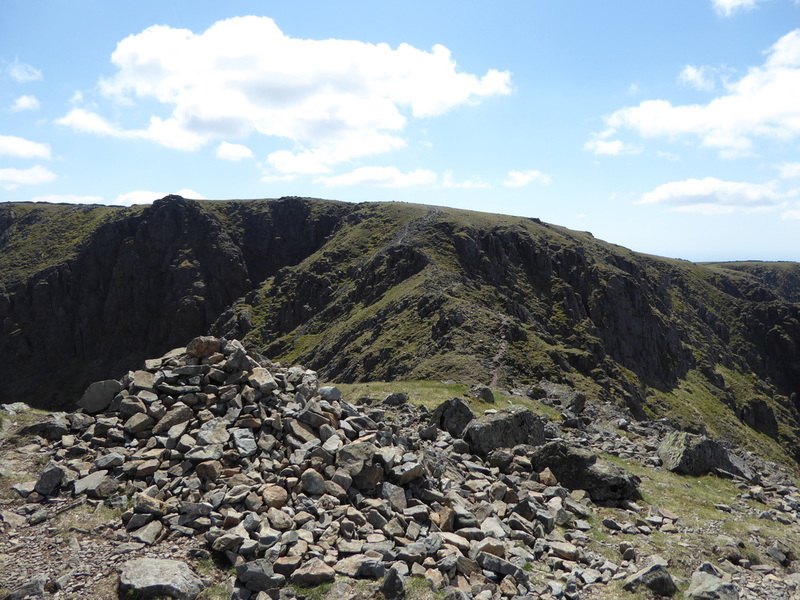 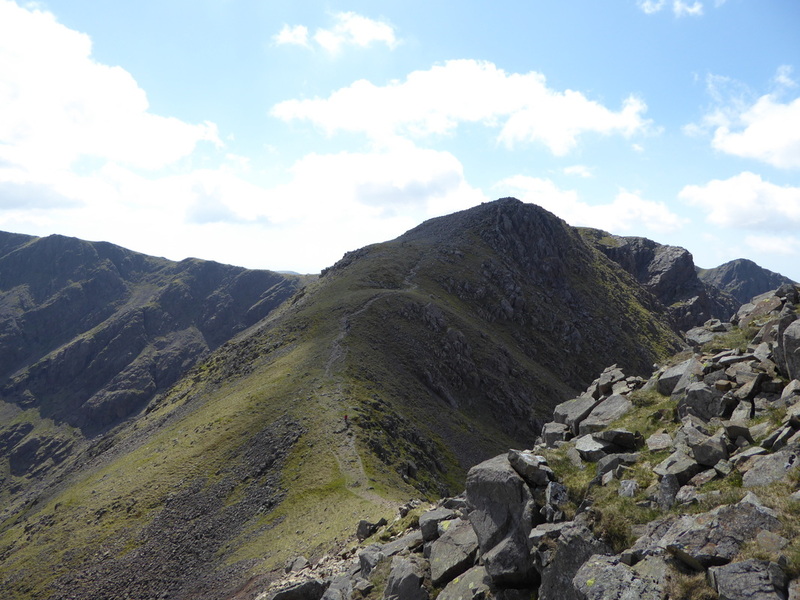 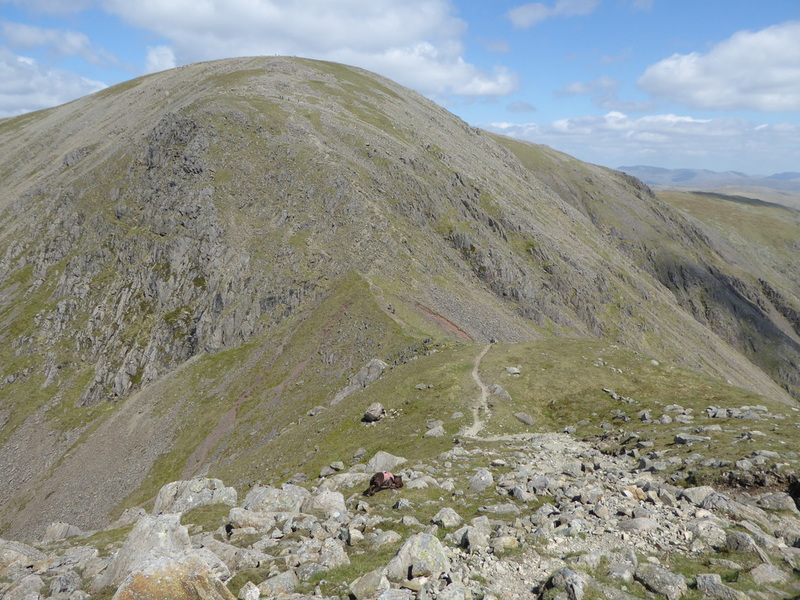 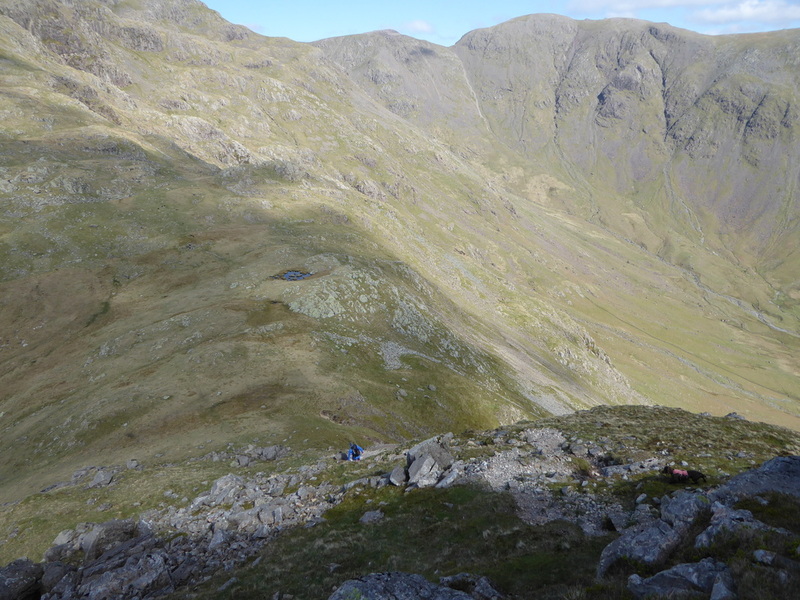 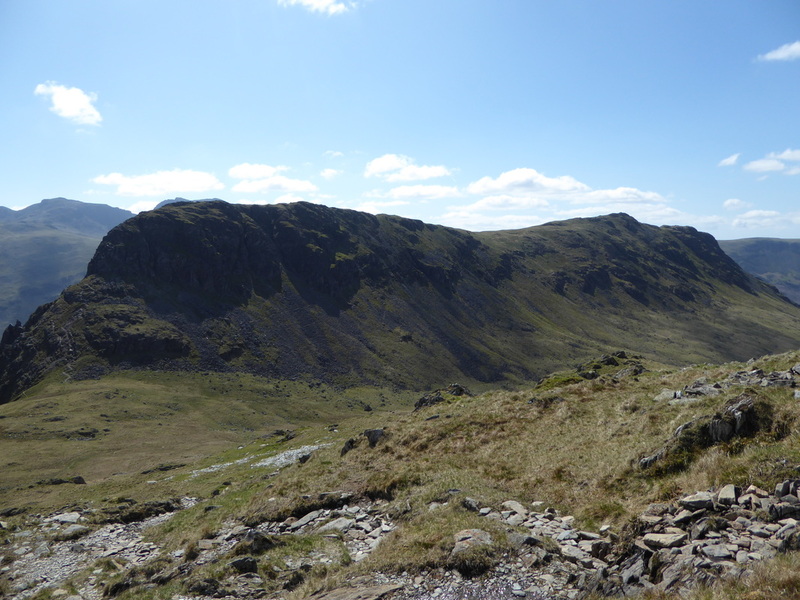 The top of the Black Sail Pass with what looks like an imposing scramble up Kirk Fell. 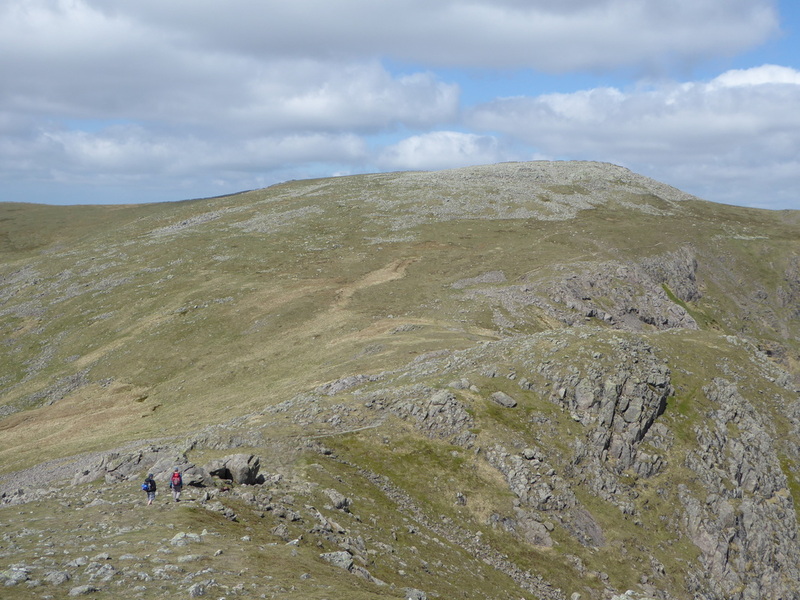 We have done the ascent up Kirk Fell from here before and it is not as bad as it looks.